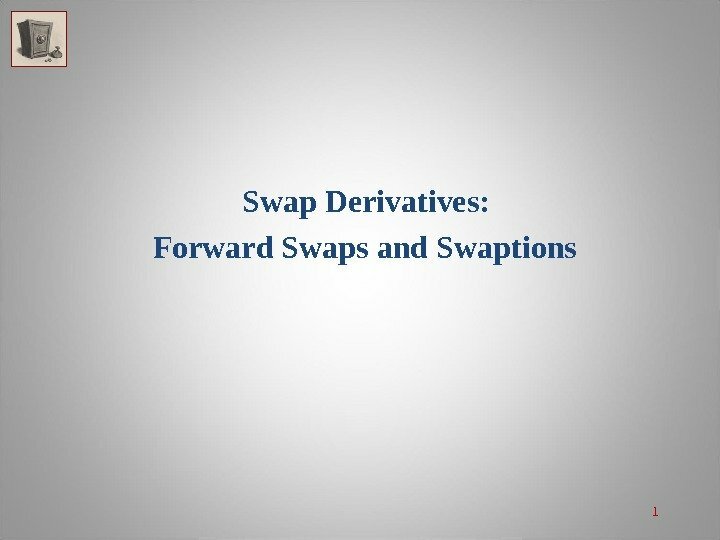 2 Swap Derivatives Today, there a number of nonstandard or non-generic swaps used by financial and non-financial corporations to manage their varied cash flow and asset and liability positions. 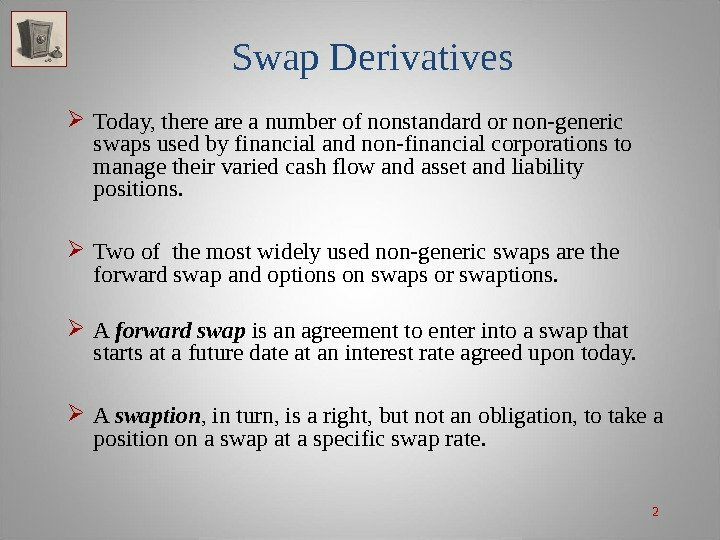 Two of the most widely used non-generic swaps are the forward swap and options on swaps or swaptions. 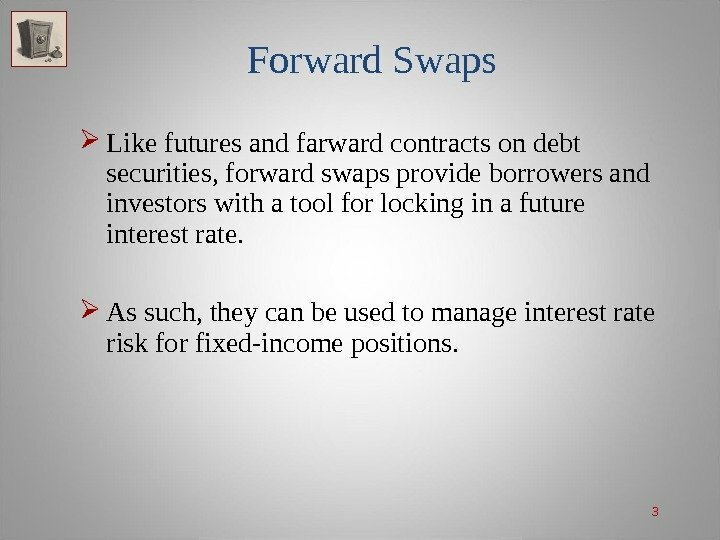 A forward swap is an agreement to enter into a swap that starts at a future date at an interest rate agreed upon today. 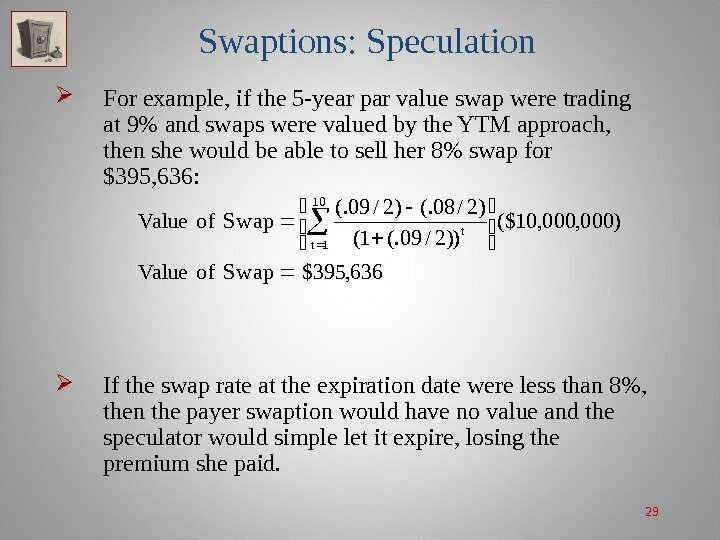 A swaption , in turn, is a right, but not an obligation, to take a position on a swap at a specific swap rate. 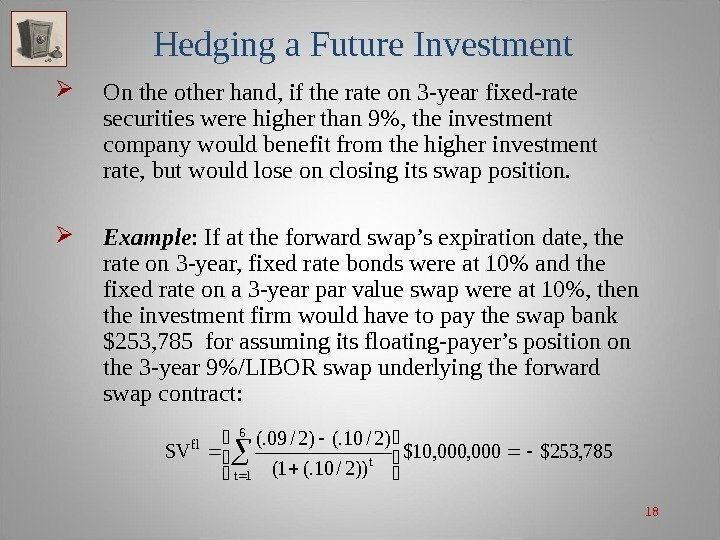 3 Forward Swaps Like futures and farward contracts on debt securities, forward swaps provide borrowers and investors with a tool for locking in a future interest rate. As such, they can be used to manage interest rate risk for fixed-income positions. 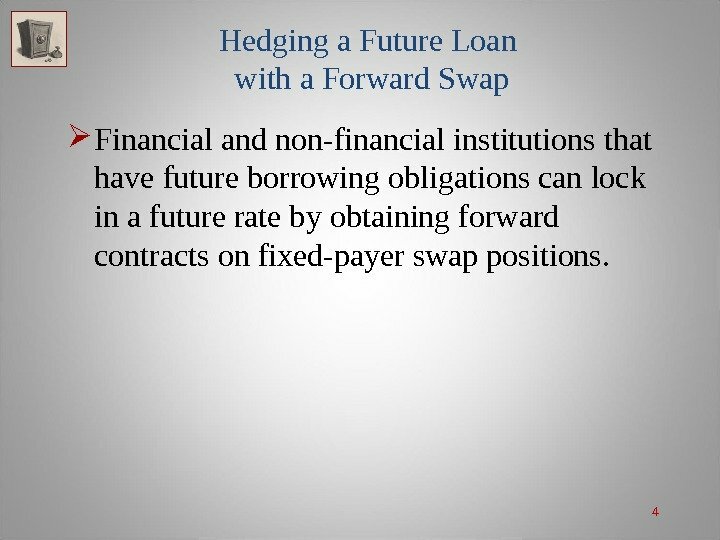 4 Hedging a Future Loan with a Forward Swap Financial and non-financial institutions that have future borrowing obligations can lock in a future rate by obtaining forward contracts on fixed-payer swap positions. 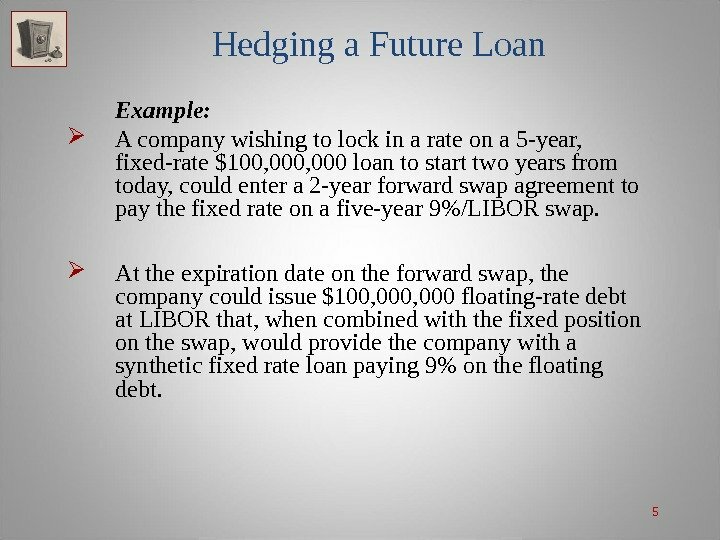 5 Hedging a Future Loan Example: A company wishing to lock in a rate on a 5 -year, fixed-rate $100, 000 loan to start two years from today, could enter a 2 -year forward swap agreement to pay the fixed rate on a five-year 9%/LIBOR swap. At the expiration date on the forward swap, the company could issue $100, 000 floating-rate debt at LIBOR that, when combined with the fixed position on the swap, would provide the company with a synthetic fixed rate loan paying 9% on the floating debt. 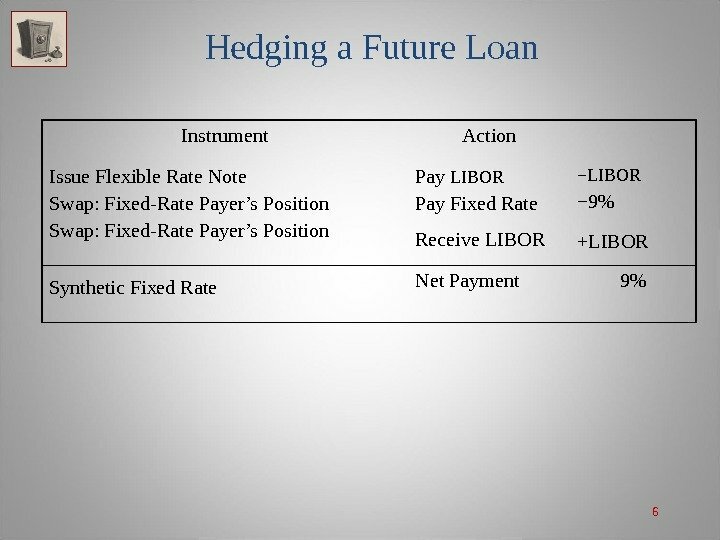 7 Hedging a Future Loan Alternatively, at the forward swap’s expiration date, the company could sell the 5 -year 9%/LIBOR swap underlying the forward swap contract and issue a 5 -year fixed-rate bond. 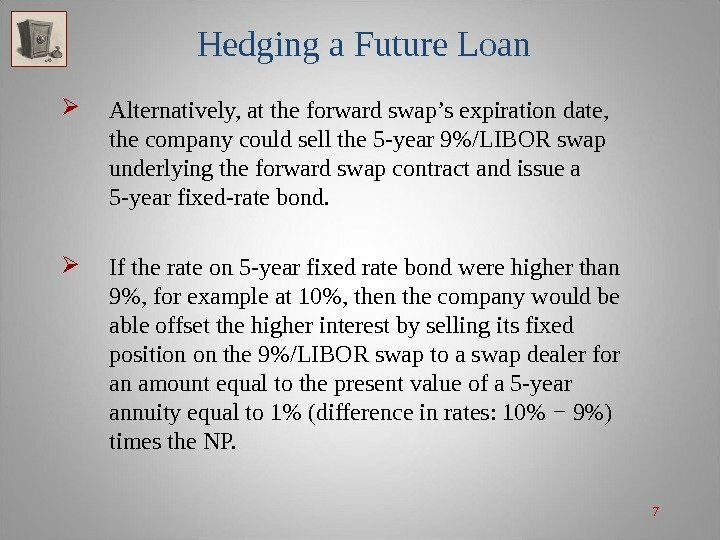 If the rate on 5 -year fixed rate bond were higher than 9%, for example at 10%, then the company would be able offset the higher interest by selling its fixed position on the 9%/LIBOR swap to a swap dealer for an amount equal to the present value of a 5 -year annuity equal to 1% (difference in rates: 10% − 9%) times the NP. 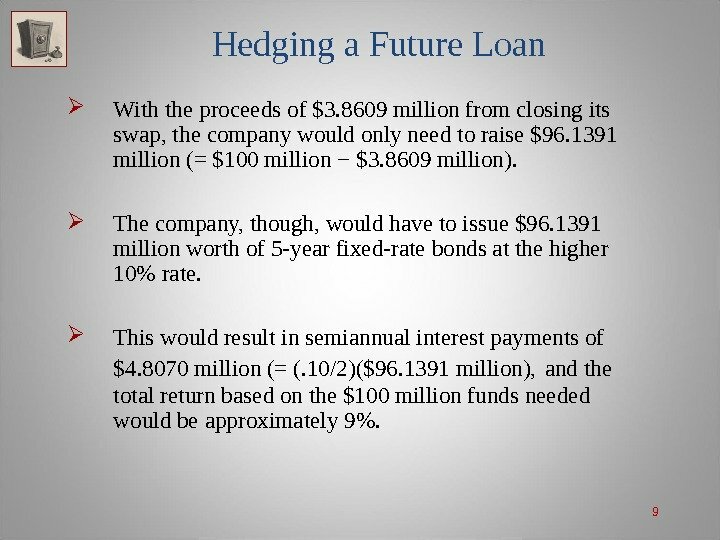 9 Hedging a Future Loan With the proceeds of $3. 8609 million from closing its swap, the company would only need to raise $96. 1391 million (= $100 million − $3. 8609 million). The company, though, would have to issue $96. 1391 million worth of 5 -year fixed-rate bonds at the higher 10% rate. This would result in semiannual interest payments of $4. 8070 million (= (. 10/2)($96. 1391 million), and the total return based on the $100 million funds needed would be approximately 9%. 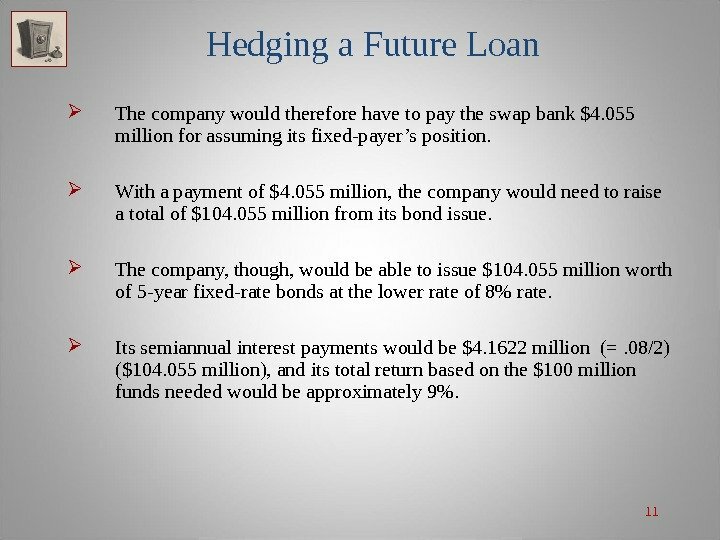 11 Hedging a Future Loan The company would therefore have to pay the swap bank $4. 055 million for assuming its fixed-payer’s position. With a payment of $4. 055 million, the company would need to raise a total of $104. 055 million from its bond issue. The company, though, would be able to issue $104. 055 million worth of 5 -year fixed-rate bonds at the lower rate of 8% rate. Its semiannual interest payments would be $4. 1622 million (=. 08/2) ($104. 055 million), and its total return based on the $100 million funds needed would be approximately 9%. 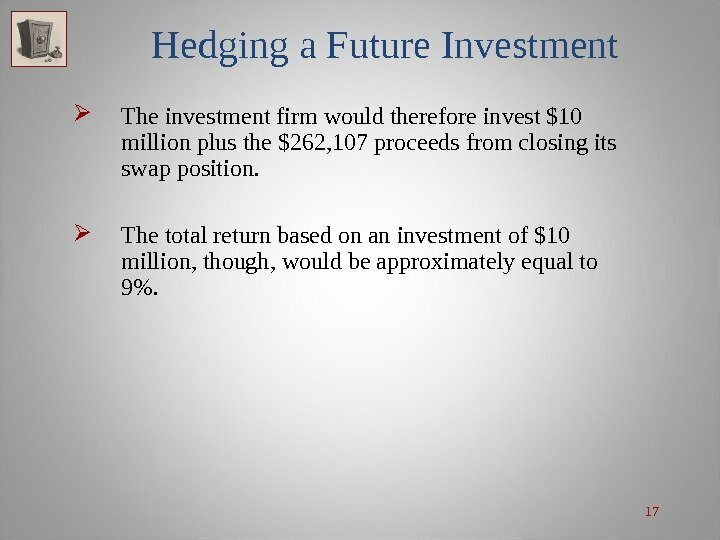 12 Hedging a Future Investment Forward swaps can also be used on the asset side to fix the rate on a future investment. Consider the case of an institutional investor planning to invest an expected $10 million cash inflow one year from now in a 3 -year, high quality fixed-rate bond. 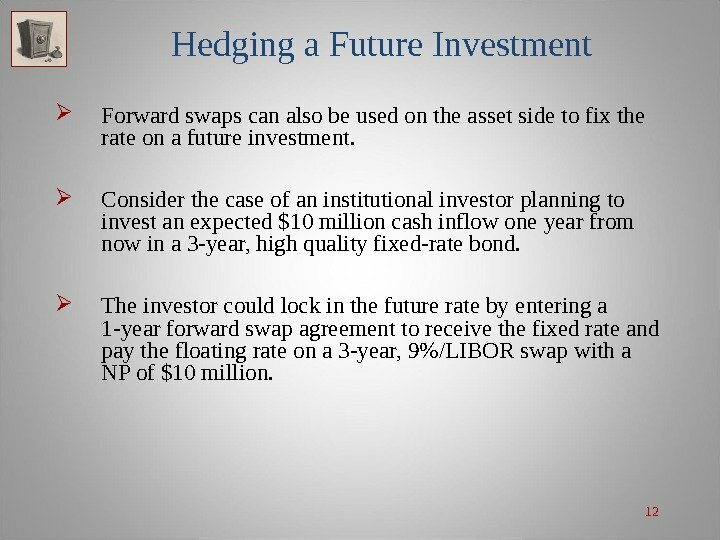 The investor could lock in the future rate by entering a 1 -year forward swap agreement to receive the fixed rate and pay the floating rate on a 3 -year, 9%/LIBOR swap with a NP of $10 million. 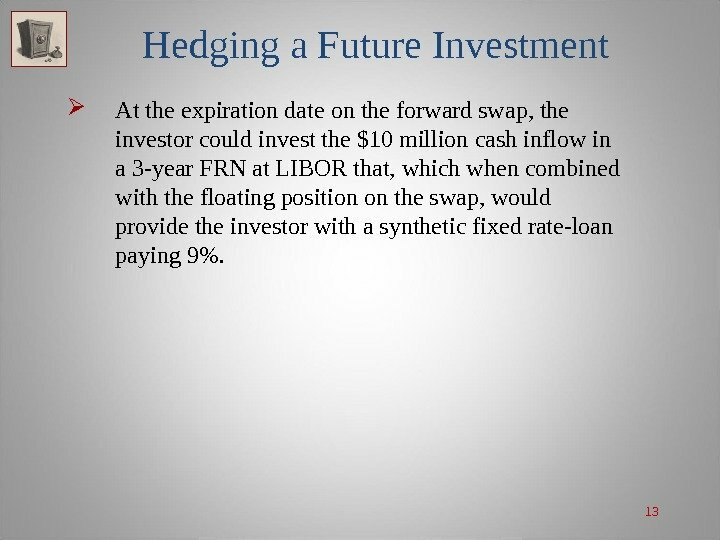 13 Hedging a Future Investment At the expiration date on the forward swap, the investor could invest the $10 million cash inflow in a 3 -year FRN at LIBOR that, which when combined with the floating position on the swap, would provide the investor with a synthetic fixed rate-loan paying 9%. 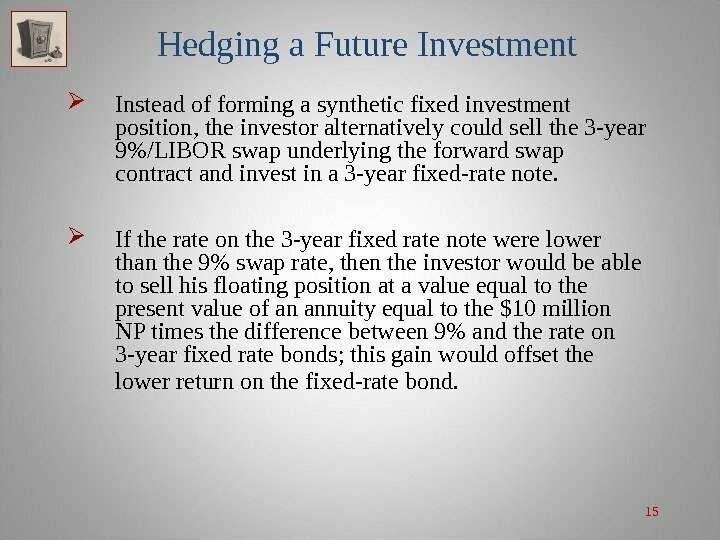 15 Hedging a Future Investment Instead of forming a synthetic fixed investment position, the investor alternatively could sell the 3 -year 9%/LIBOR swap underlying the forward swap contract and invest in a 3 -year fixed-rate note. 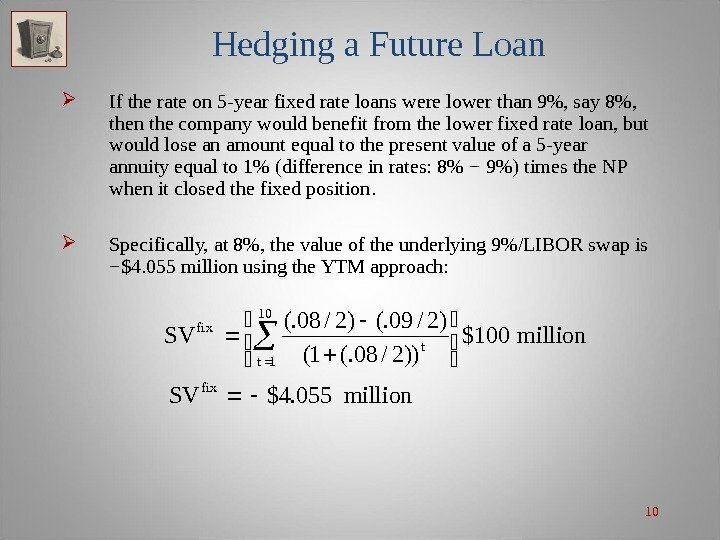 If the rate on the 3 -year fixed rate note were lower than the 9% swap rate, then the investor would be able to sell his floating position at a value equal to the present value of an annuity equal to the $10 million NP times the difference between 9% and the rate on 3 -year fixed rate bonds; this gain would offset the lower return on the fixed-rate bond. 17 Hedging a Future Investment The investment firm would therefore invest $10 million plus the $262, 107 proceeds from closing its swap position. The total return based on an investment of $10 million, though, would be approximately equal to 9%. 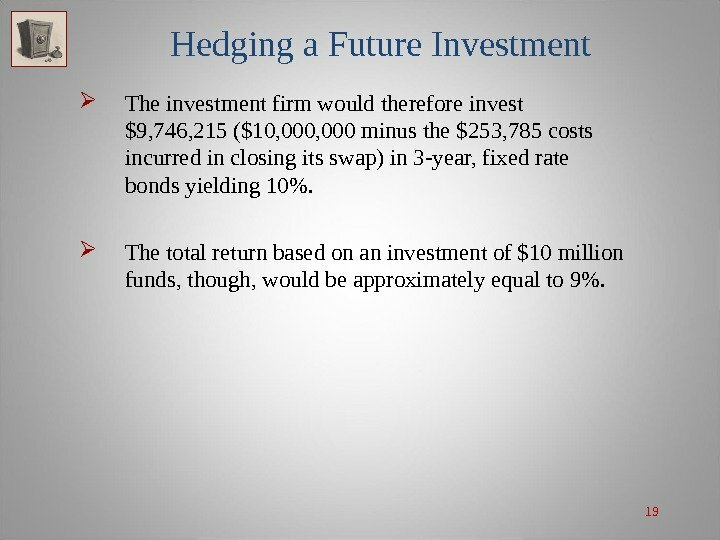 19 Hedging a Future Investment The investment firm would therefore invest $9, 746, 215 ($10, 000 minus the $253, 785 costs incurred in closing its swap) in 3 -year, fixed rate bonds yielding 10%. The total return based on an investment of $10 million funds, though, would be approximately equal to 9%. 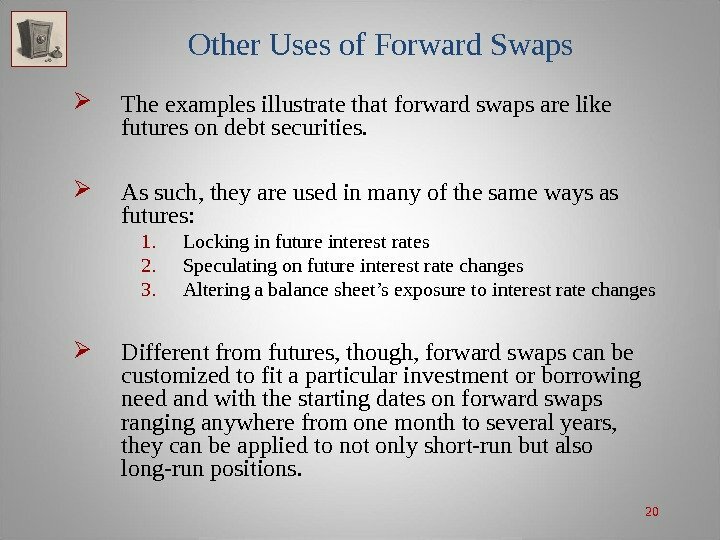 20 Other Uses of Forward Swaps The examples illustrate that forward swaps are like futures on debt securities. As such, they are used in many of the same ways as futures: 1. Locking in future interest rates 2. Speculating on future interest rate changes 3. 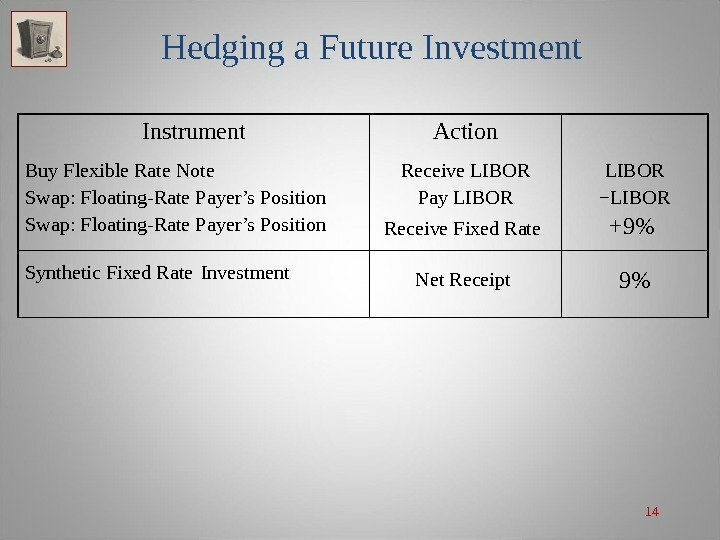 Altering a balance sheet’s exposure to interest rate changes Different from futures, though, forward swaps can be customized to fit a particular investment or borrowing need and with the starting dates on forward swaps ranging anywhere from one month to several years, they can be applied to not only short-run but also long-run positions. 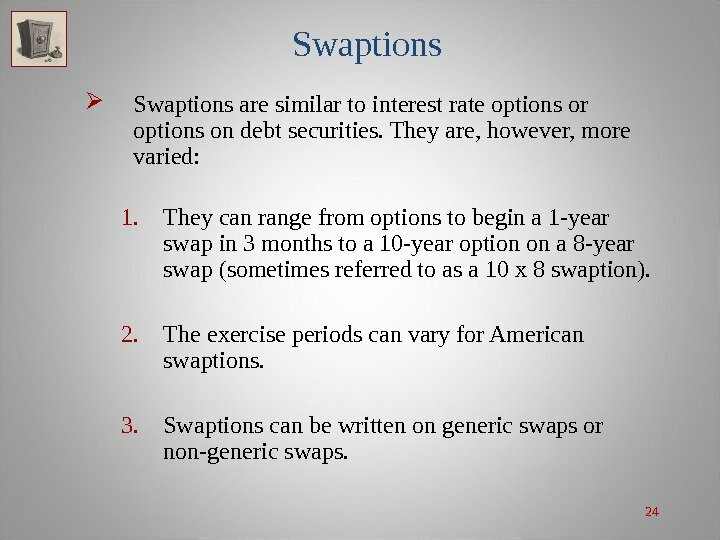 21 Swaptions One of the most innovative non-generic swaps is the swap option or simply swaption. 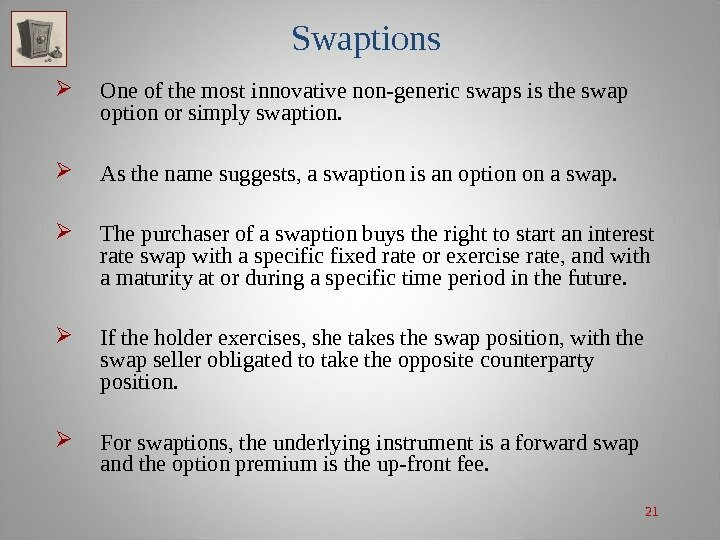 As the name suggests, a swaption is an option on a swap. The purchaser of a swaption buys the right to start an interest rate swap with a specific fixed rate or exercise rate, and with a maturity at or during a specific time period in the future. 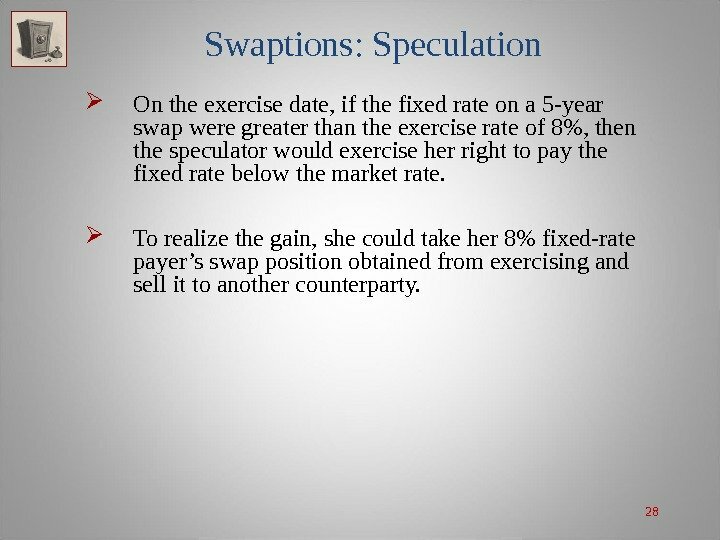 If the holder exercises, she takes the swap position, with the swap seller obligated to take the opposite counterparty position. For swaptions, the underlying instrument is a forward swap and the option premium is the up-front fee. 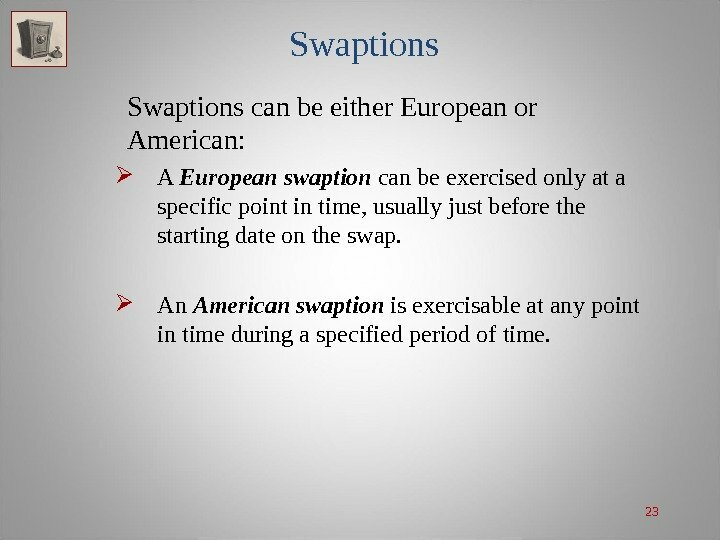 23 Swaptions can be either European or American: A European swaption can be exercised only at a specific point in time, usually just before the starting date on the swap. An American swaption is exercisable at any point in time during a specified period of time. 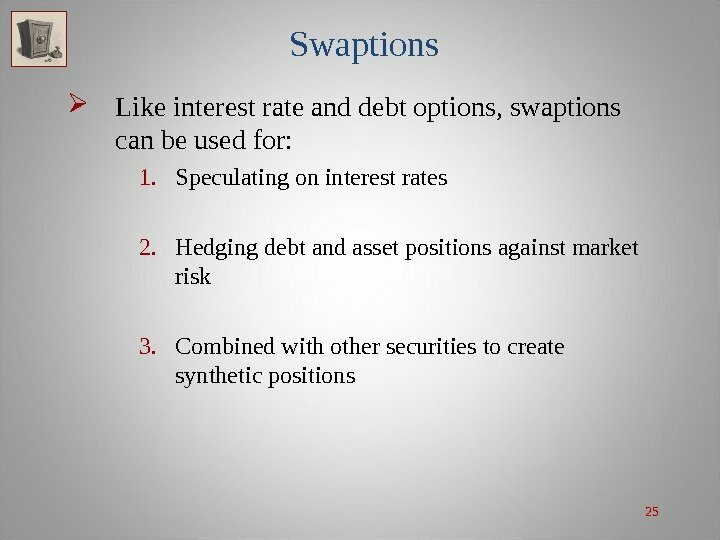 24 Swaptions are similar to interest rate options or options on debt securities. They are, however, more varied: 1. They can range from options to begin a 1 -year swap in 3 months to a 10 -year option on a 8 -year swap (sometimes referred to as a 10 x 8 swaption). 2. The exercise periods can vary for American swaptions. 3. 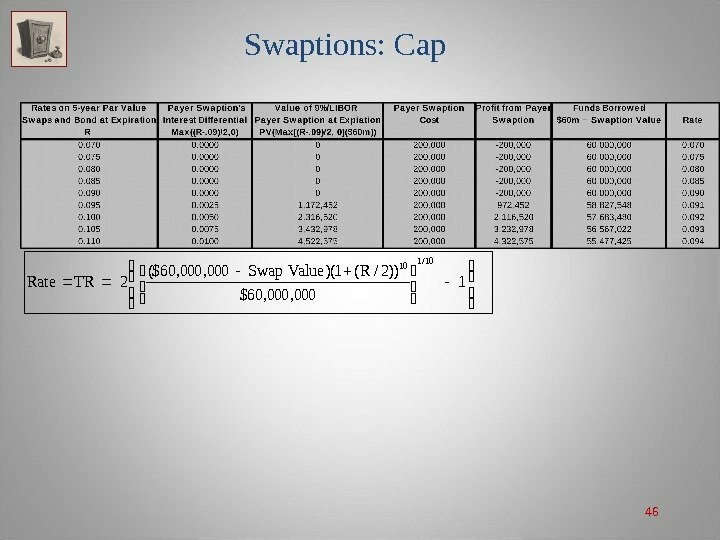 Swaptions can be written on generic swaps or non-generic swaps. 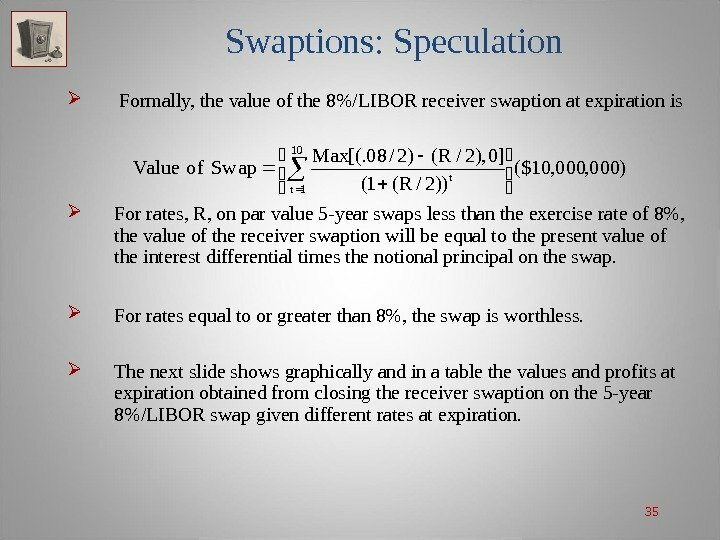 26 Swaptions: Speculation Suppose a speculator expects the rate on high quality, 5 -year fixed rate bonds to increase from their current 8% level. 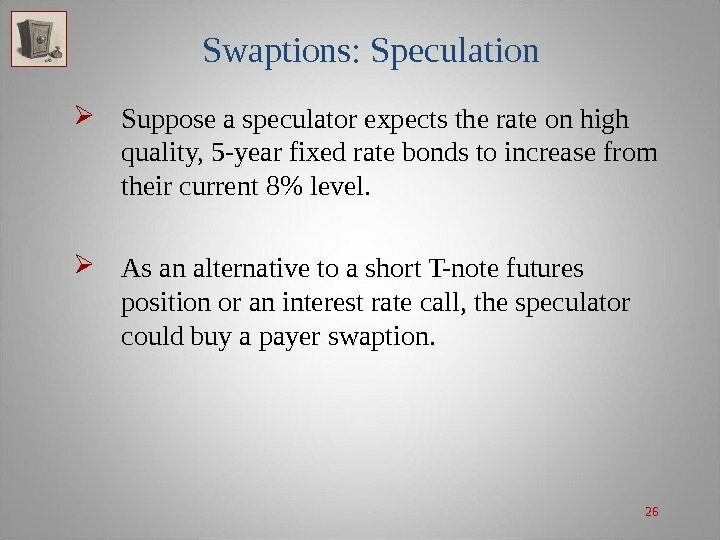 As an alternative to a short T-note futures position or an interest rate call, the speculator could buy a payer swaption. 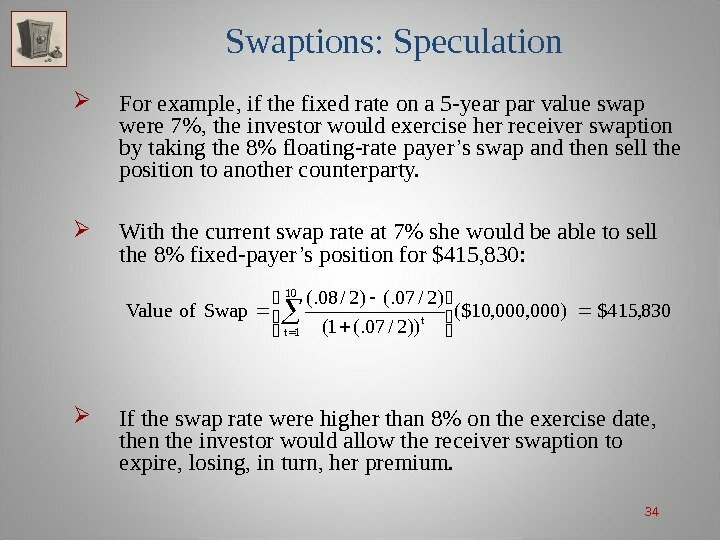 28 Swaptions: Speculation On the exercise date, if the fixed rate on a 5 -year swap were greater than the exercise rate of 8%, then the speculator would exercise her right to pay the fixed rate below the market rate. To realize the gain, she could take her 8% fixed-rate payer’s swap position obtained from exercising and sell it to another counterparty. 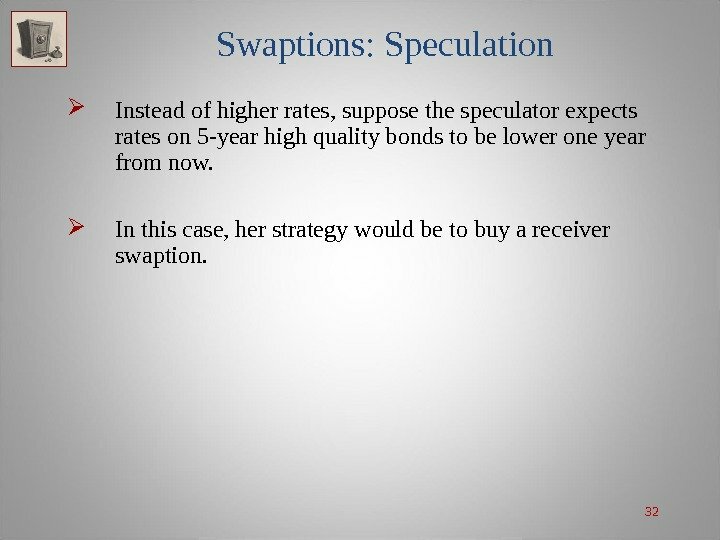 32 Swaptions: Speculation Instead of higher rates, suppose the speculator expects rates on 5 -year high quality bonds to be lower one year from now. In this case, her strategy would be to buy a receiver swaption. 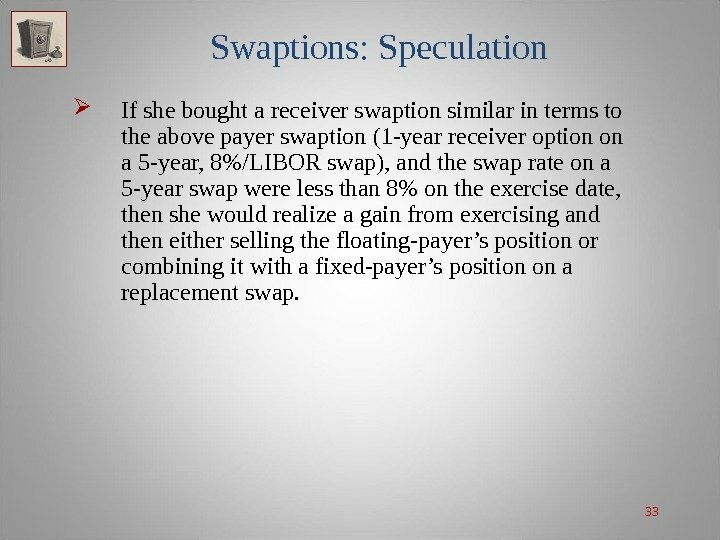 33 Swaptions: Speculation If she bought a receiver swaption similar in terms to the above payer swaption (1 -year receiver option on a 5 -year, 8%/LIBOR swap), and the swap rate on a 5 -year swap were less than 8% on the exercise date, then she would realize a gain from exercising and then either selling the floating-payer’s position or combining it with a fixed-payer’s position on a replacement swap. 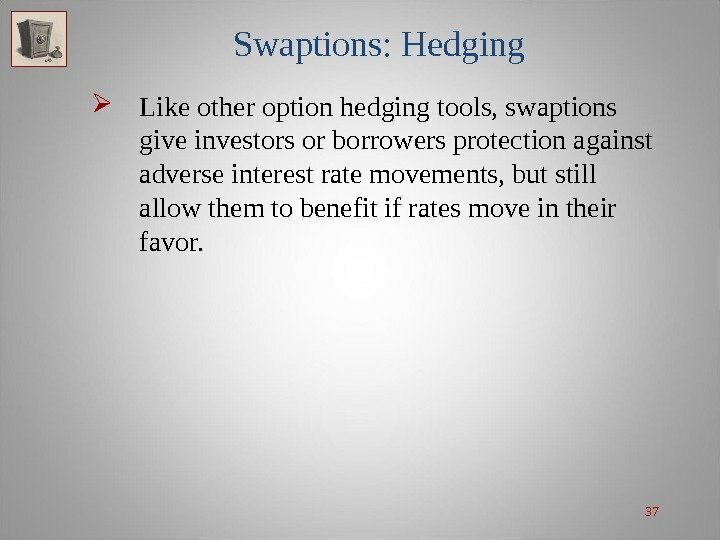 37 Swaptions: Hedging Like other option hedging tools, swaptions give investors or borrowers protection against adverse interest rate movements, but still allow them to benefit if rates move in their favor. 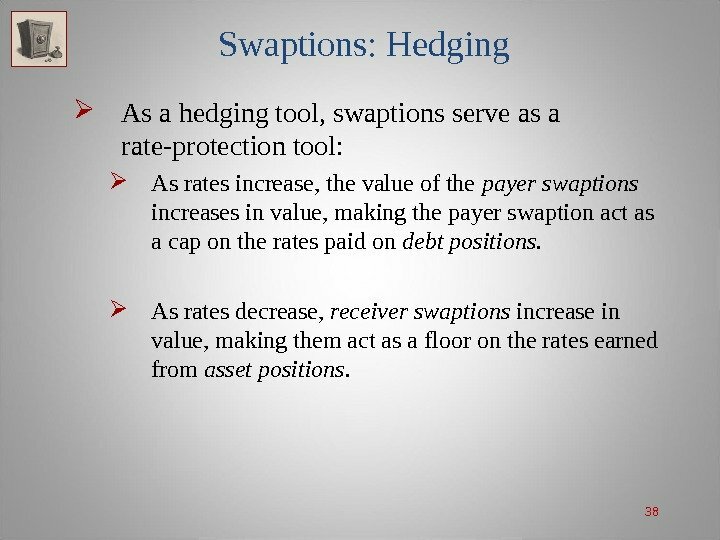 38 Swaptions: Hedging As a hedging tool, swaptions serve as a rate-protection tool: As rates increase, the value of the payer swaptions increases in value, making the payer swaption act as a cap on the rates paid on debt positions. As rates decrease, receiver swaptions increase in value, making them act as a floor on the rates earned from asset positions. 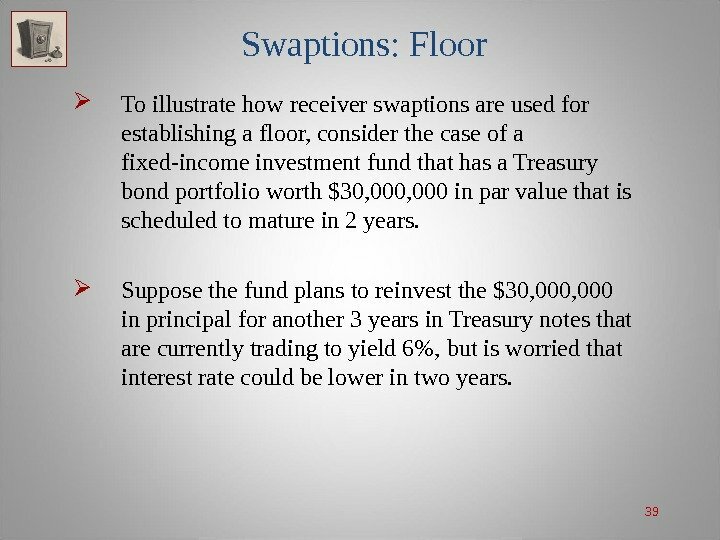 39 Swaptions: Floor To illustrate how receiver swaptions are used for establishing a floor, consider the case of a fixed-income investment fund that has a Treasury bond portfolio worth $30, 000 in par value that is scheduled to mature in 2 years. Suppose the fund plans to reinvest the $30, 000 in principal for another 3 years in Treasury notes that are currently trading to yield 6%, but is worried that interest rate could be lower in two years. 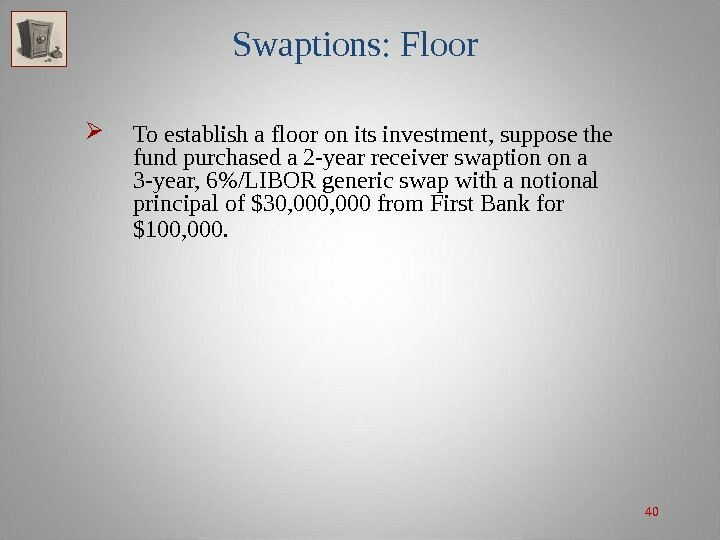 40 Swaptions: Floor To establish a floor on its investment, suppose the fund purchased a 2 -year receiver swaption on a 3 -year, 6%/LIBOR generic swap with a notional principal of $30, 000 from First Bank for $100, 000. 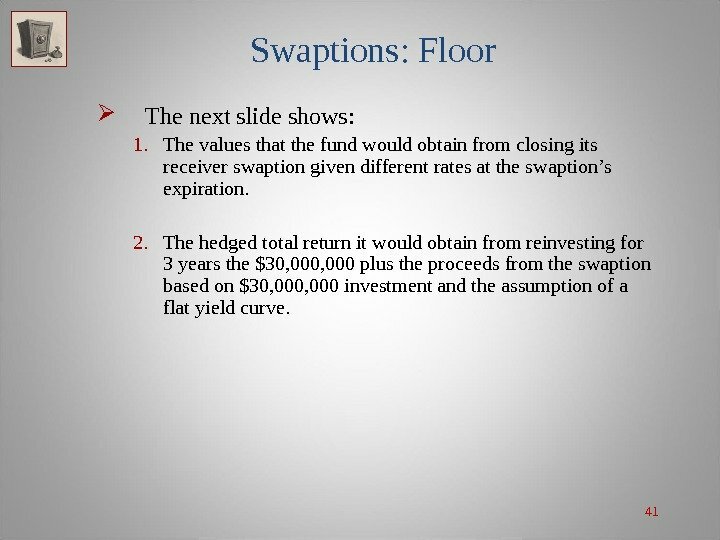 41 Swaptions: Floor The next slide shows: 1. The values that the fund would obtain from closing its receiver swaption given different rates at the swaption’s expiration. 2. The hedged total return it would obtain from reinvesting for 3 years the $30, 000 plus the proceeds from the swaption based on $30, 000 investment and the assumption of a flat yield curve. 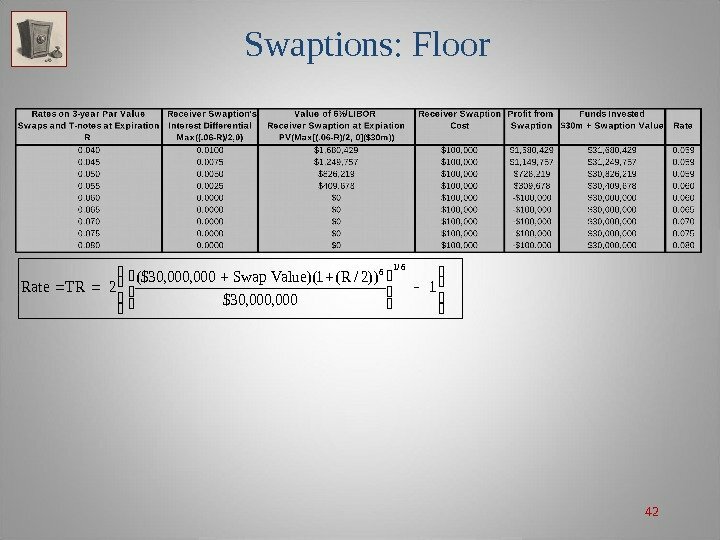 43 Swaptions: Floor As shown in the exhibit slide, for rates less than 6% the swaption values increase as rates fall, in turn, offsetting the lower investment rates and yielding a rate on the investment of approximately 6%. On the other hand, for rates equal or greater than 6%, the swaption are worthless, whereas the investment’s total return increases as rates increase. 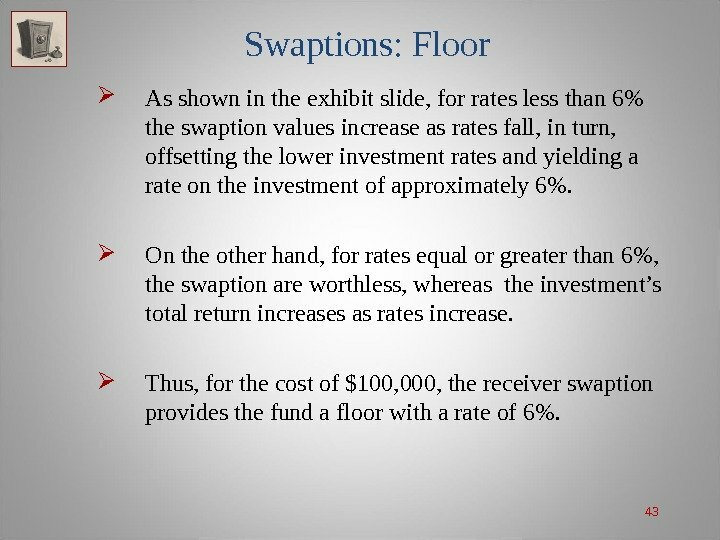 Thus, for the cost of $100, 000, the receiver swaption provides the fund a floor with a rate of 6%. 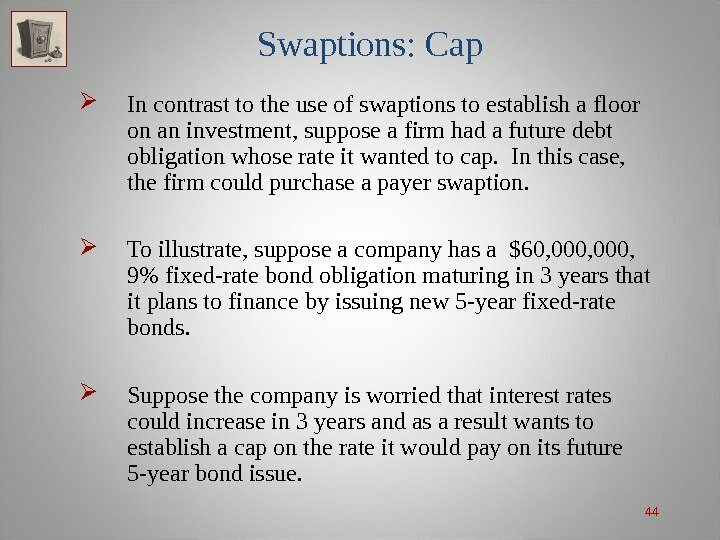 44 Swaptions: Cap In contrast to the use of swaptions to establish a floor on an investment, suppose a firm had a future debt obligation whose rate it wanted to cap. In this case, the firm could purchase a payer swaption. To illustrate, suppose a company has a $60, 000, 9% fixed-rate bond obligation maturing in 3 years that it plans to finance by issuing new 5 -year fixed-rate bonds. Suppose the company is worried that interest rates could increase in 3 years and as a result wants to establish a cap on the rate it would pay on its future 5 -year bond issue. 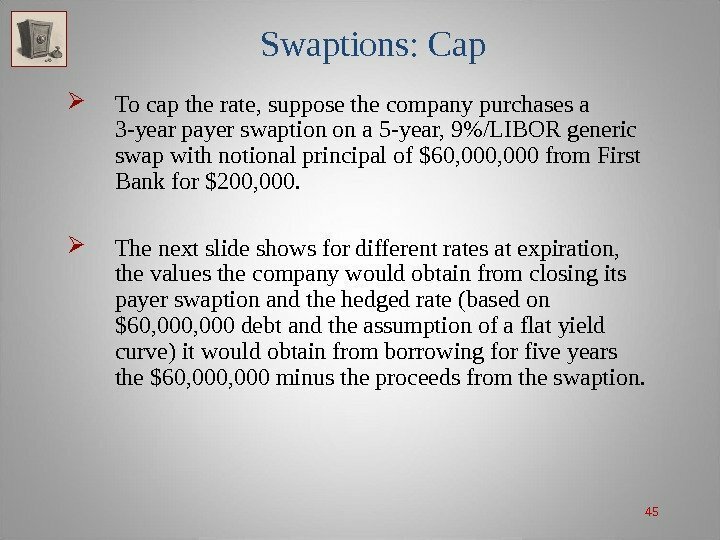 45 Swaptions: Cap To cap the rate, suppose the company purchases a 3 -year payer swaption on a 5 -year, 9%/LIBOR generic swap with notional principal of $60, 000 from First Bank for $200, 000. 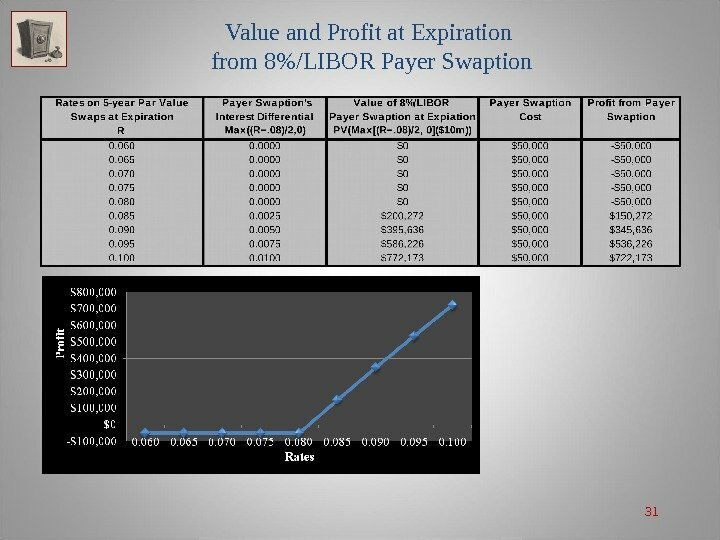 The next slide shows for different rates at expiration, the values the company would obtain from closing its payer swaption and the hedged rate (based on $60, 000 debt and the assumption of a flat yield curve) it would obtain from borrowing for five years the $60, 000 minus the proceeds from the swaption. 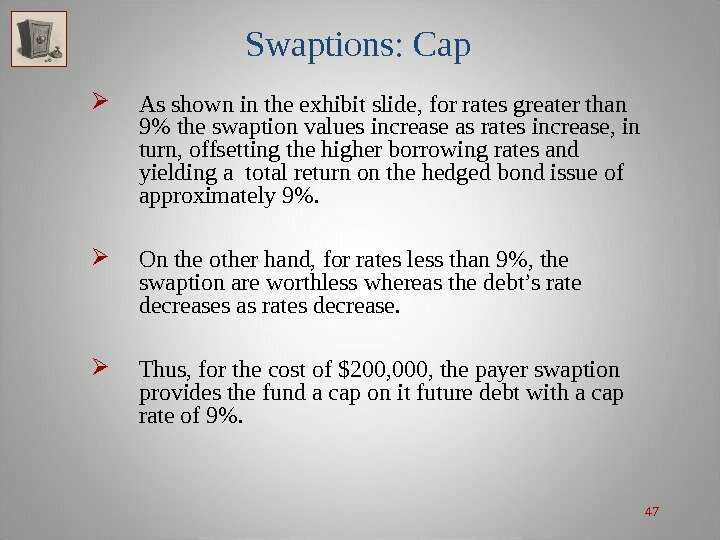 47 Swaptions: Cap As shown in the exhibit slide, for rates greater than 9% the swaption values increase as rates increase, in turn, offsetting the higher borrowing rates and yielding a total return on the hedged bond issue of approximately 9%. On the other hand, for rates less than 9%, the swaption are worthless whereas the debt’s rate decreases as rates decrease. 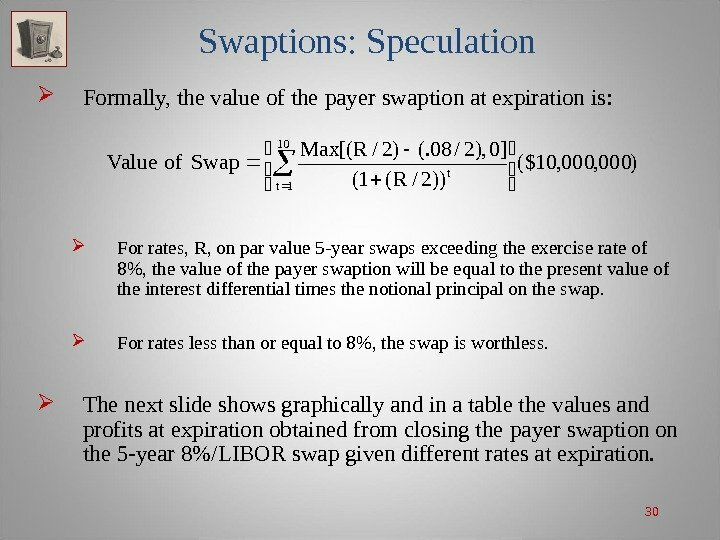 Thus, for the cost of $200, 000, the payer swaption provides the fund a cap on it future debt with a cap rate of 9%. 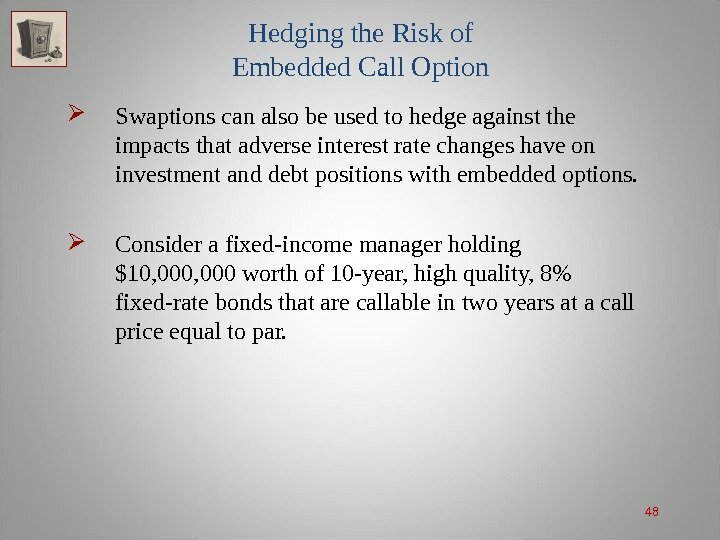 48 Hedging the Risk of Embedded Call Option Swaptions can also be used to hedge against the impacts that adverse interest rate changes have on investment and debt positions with embedded options. Consider a fixed-income manager holding $10, 000 worth of 10 -year, high quality, 8% fixed-rate bonds that are callable in two years at a call price equal to par. 49 Hedging the Risk of Embedded Call Option Suppose the manager expects a decrease in rates over the next two years, increasing the likelihood that his bonds will be called and he will be forced to reinvest in a market with lower rates. 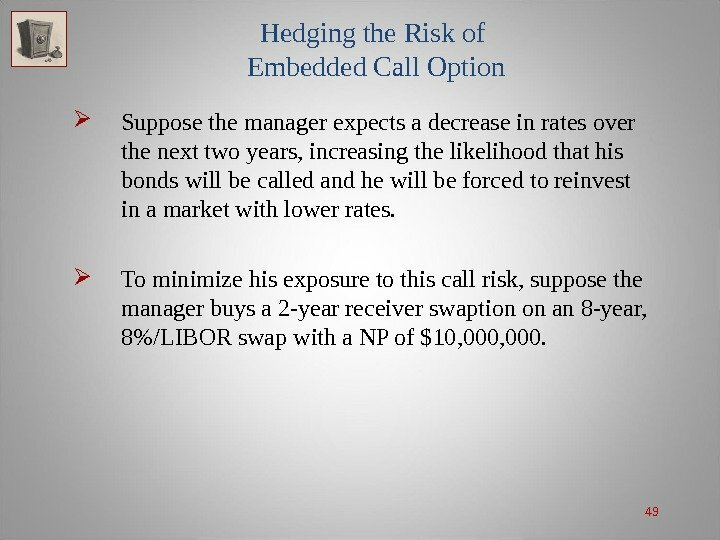 To minimize his exposure to this call risk, suppose the manager buys a 2 -year receiver swaption on an 8 -year, 8%/LIBOR swap with a NP of $10, 000. 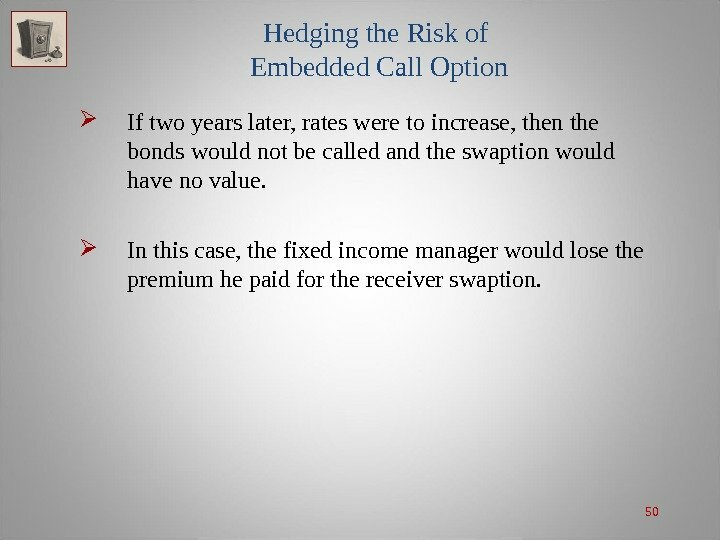 50 Hedging the Risk of Embedded Call Option If two years later, rates were to increase, then the bonds would not be called and the swaption would have no value. In this case, the fixed income manager would lose the premium he paid for the receiver swaption. 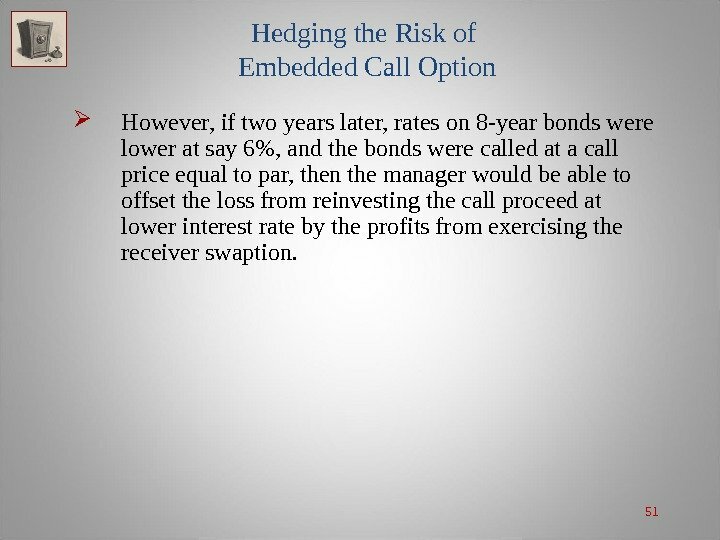 51 Hedging the Risk of Embedded Call Option However, if two years later, rates on 8 -year bonds were lower at say 6%, and the bonds were called at a call price equal to par, then the manager would be able to offset the loss from reinvesting the call proceed at lower interest rate by the profits from exercising the receiver swaption. 52 Hedging the Risk of Embedded Put Option The contrasting case of a fixed-income manager hedging callable bonds would be the case of a financial manager who issued putable bonds some time ago and was now concerned that rates might increase in the future. If rates did increase and bondholders exercised their option to sell the bonds back to the issuer at a specified price, the issuer would have to finance the purchase by issuing new bonds paying higher rates. 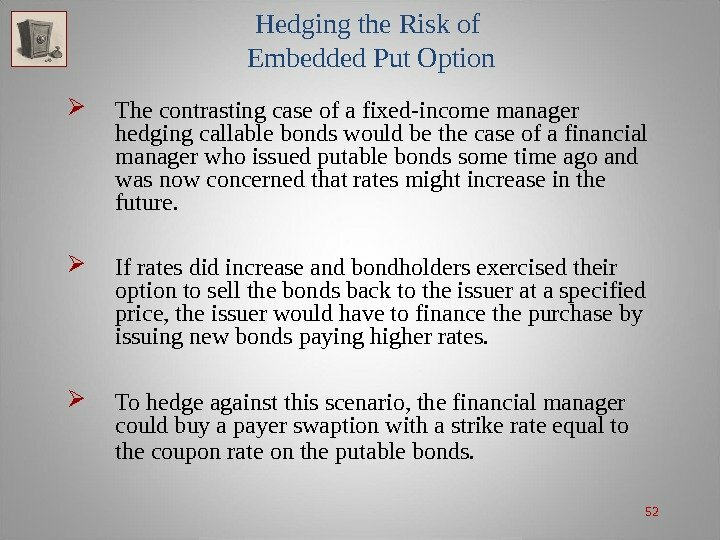 To hedge against this scenario, the financial manager could buy a payer swaption with a strike rate equal to the coupon rate on the putable bonds. 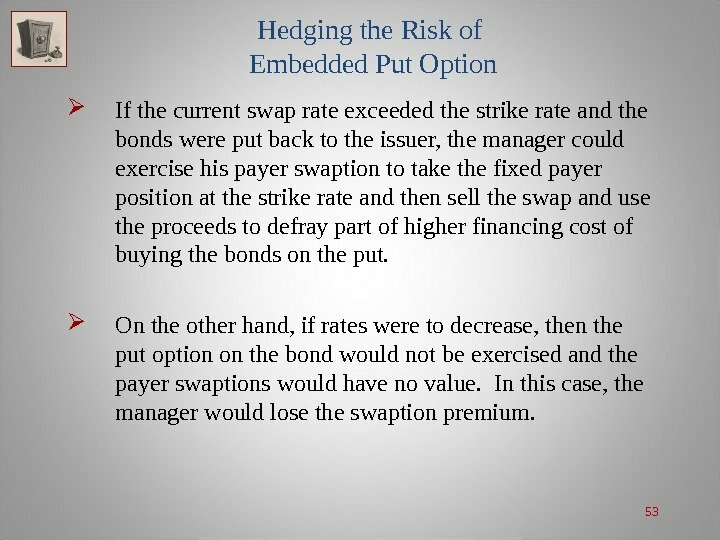 53 Hedging the Risk of Embedded Put Option If the current swap rate exceeded the strike rate and the bonds were put back to the issuer, the manager could exercise his payer swaption to take the fixed payer position at the strike rate and then sell the swap and use the proceeds to defray part of higher financing cost of buying the bonds on the put. On the other hand, if rates were to decrease, then the put option on the bond would not be exercised and the payer swaptions would have no value. In this case, the manager would lose the swaption premium. 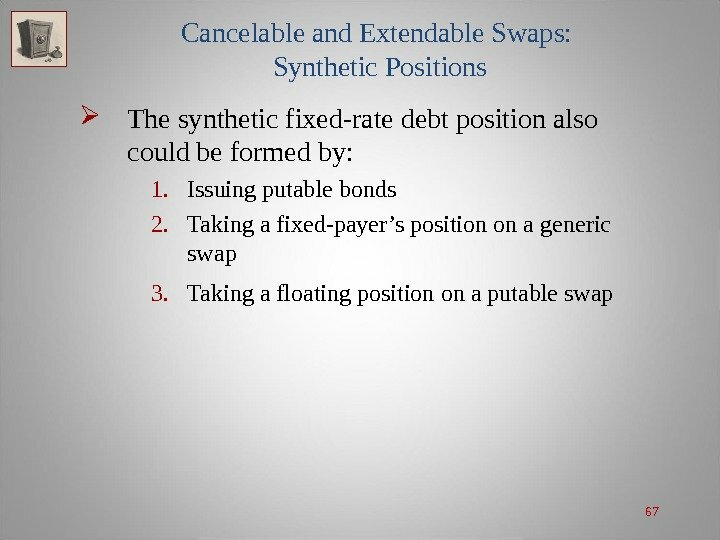 54 Synthetic Positions With swaptions, generic swaps, and non-generic swaps, there a number of synthetic asset and liability permutations: Callable and putable debt, callable and putable bonds, flexible rate securities, and flexible-rate debt. Example : A company that wants to finance a $50, 000 capital expenditure with 7 -year, option-free, 9% fixed-rate debt could issue 7 -year, option-free, fixed-rate bonds or create a synthetic 7 -year bond by issuing 7 -year FRNs and taking a fixed-payer’s position on a 7 -year swap. 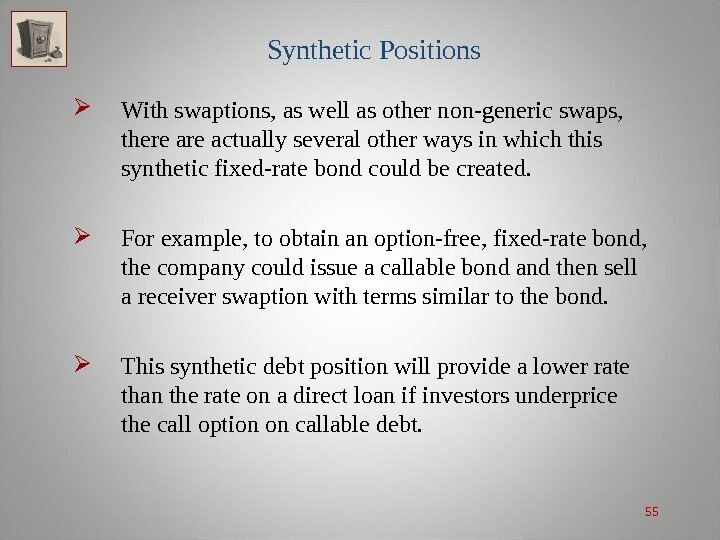 55 Synthetic Positions With swaptions, as well as other non-generic swaps, there actually several other ways in which this synthetic fixed-rate bond could be created. For example, to obtain an option-free, fixed-rate bond, the company could issue a callable bond and then sell a receiver swaption with terms similar to the bond. This synthetic debt position will provide a lower rate than the rate on a direct loan if investors underprice the call option on callable debt. 56 Cancelable and Extendable Swaps can have clauses giving the counterparty the right to extend the option or to cancel the option. 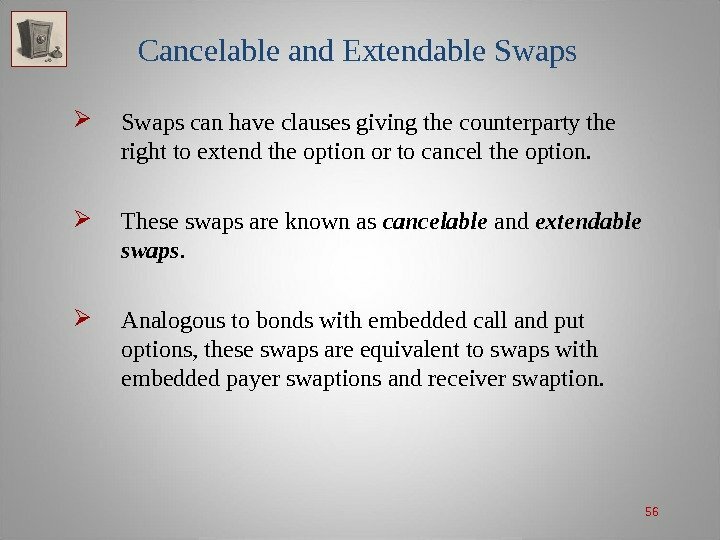 These swaps are known as cancelable and extendable swaps. 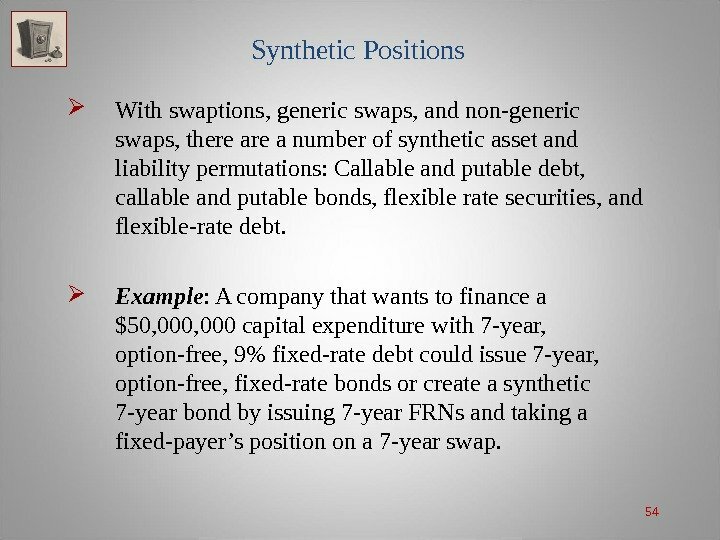 Analogous to bonds with embedded call and put options, these swaps are equivalent to swaps with embedded payer swaptions and receiver swaption. 57 Cancelable Swap A cancelable swap is a swap in which one of the counterparties has the option to terminate one or more payments. 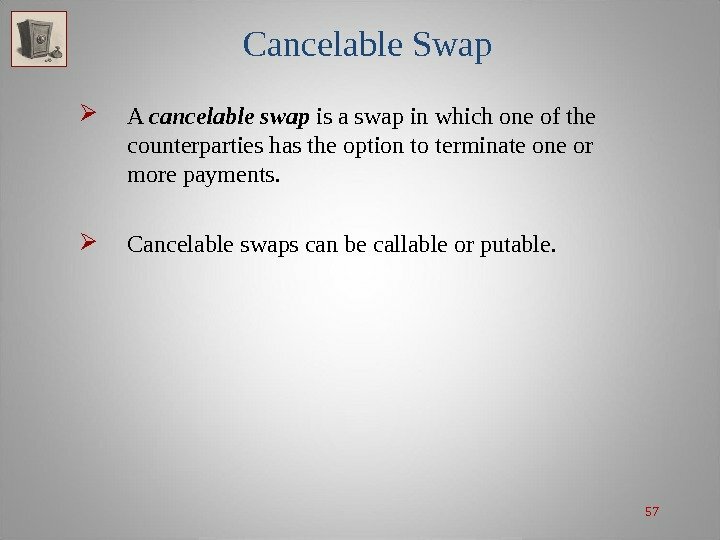 Cancelable swaps can be callable or putable. 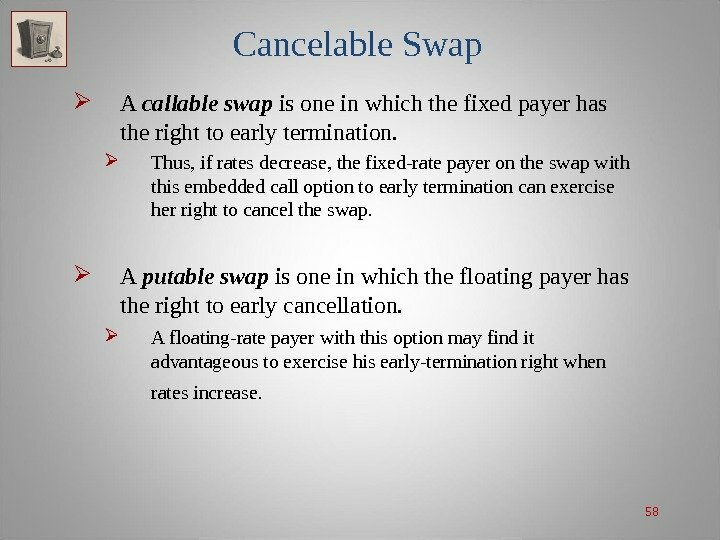 58 Cancelable Swap A callable swap is one in which the fixed payer has the right to early termination. 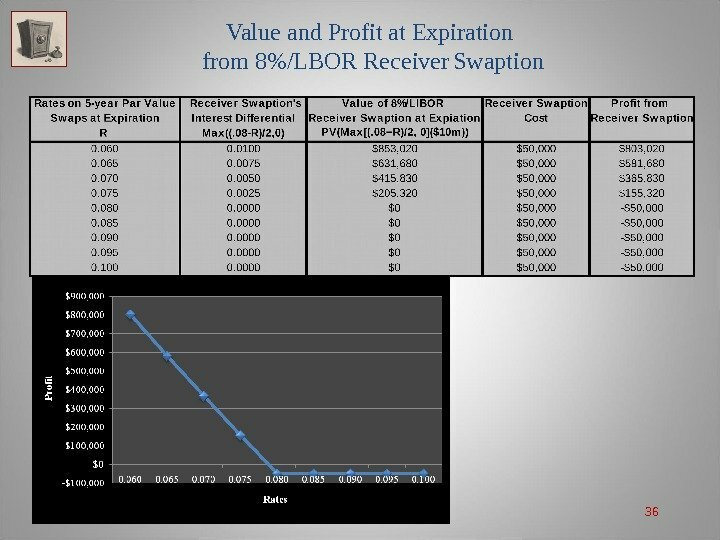 Thus, if rates decrease, the fixed-rate payer on the swap with this embedded call option to early termination can exercise her right to cancel the swap. A putable swap is one in which the floating payer has the right to early cancellation. A floating-rate payer with this option may find it advantageous to exercise his early-termination right when rates increase. 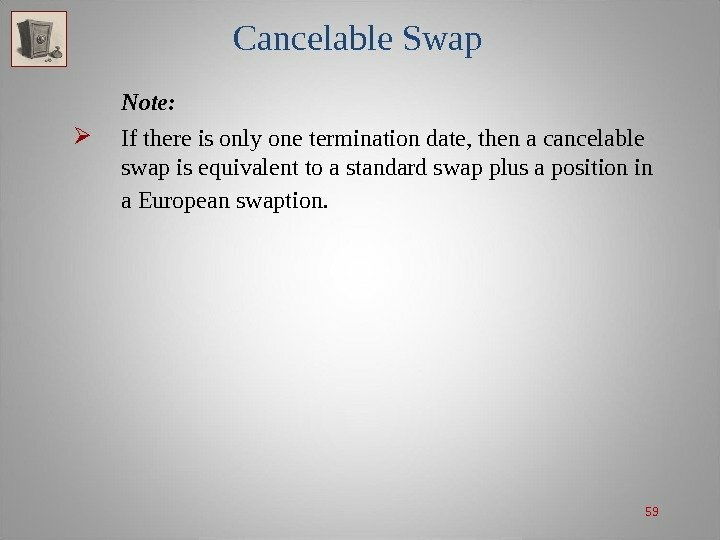 59 Cancelable Swap Note: If there is only one termination date, then a cancelable swap is equivalent to a standard swap plus a position in a European swaption. 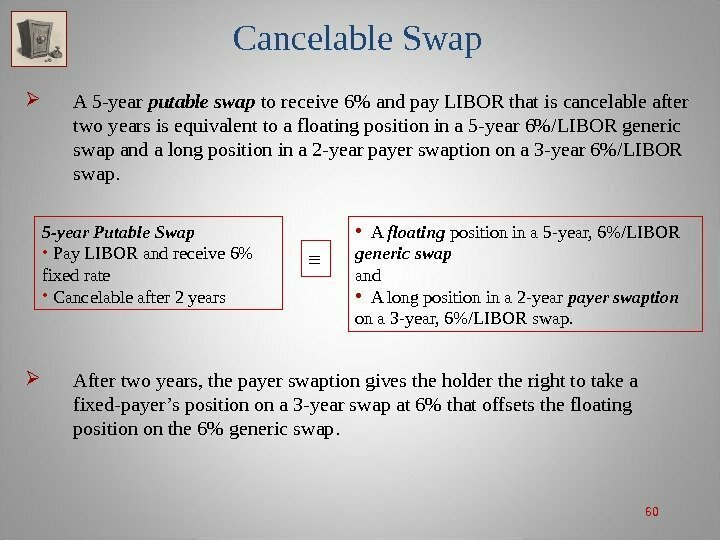 60 Cancelable Swap A 5 -year putable swap to receive 6% and pay LIBOR that is cancelable after two years is equivalent to a floating position in a 5 -year 6%/LIBOR generic swap and a long position in a 2 -year payer swaption on a 3 -year 6%/LIBOR swap. 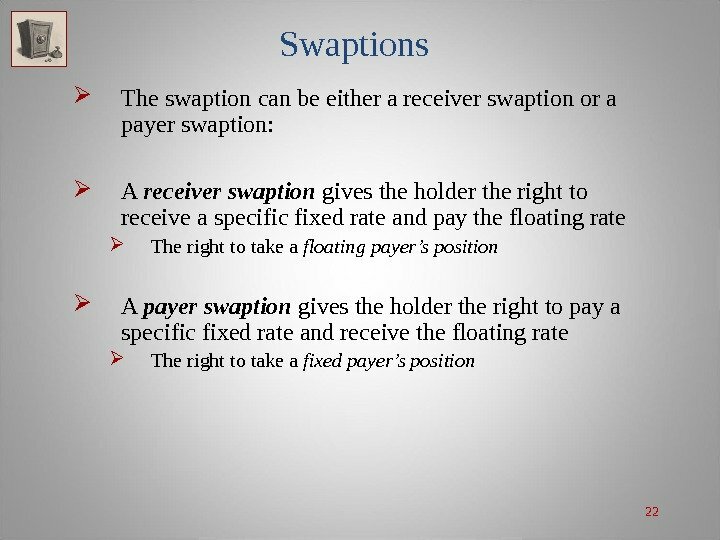 After two years, the payer swaption gives the holder the right to take a fixed-payer’s position on a 3 -year swap at 6% that offsets the floating position on the 6% generic swap. 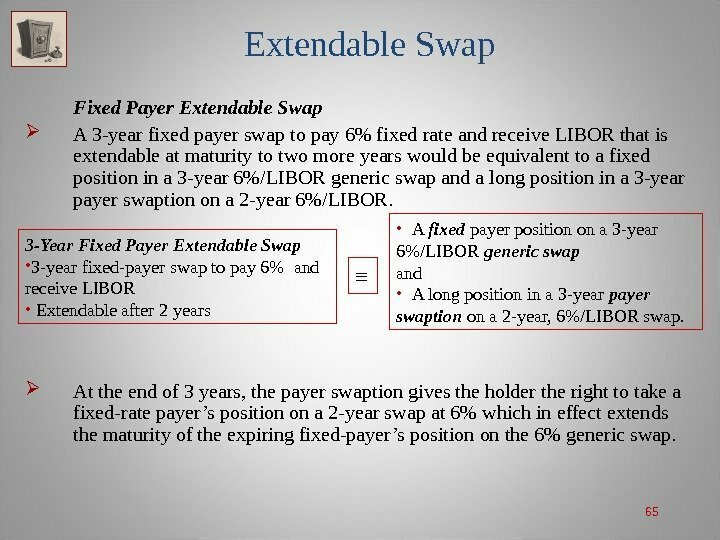 5 -year Putable Swap • Pay LIBOR and receive 6% fixed rate • Cancelable after 2 years ≡ • A floating position in a 5 -year, 6%/LIBOR generic swap and • A long position in a 2 -year payer swaption on a 3 -year, 6%/LIBOR swap. 62 Extendable Swap An extendable swap is just the opposite of a cancelable swap. It is a swap that has an option to lengthen the terms of the original swap. The swap allows the holder to take advantage of current rates and extend the maturity of the swap. 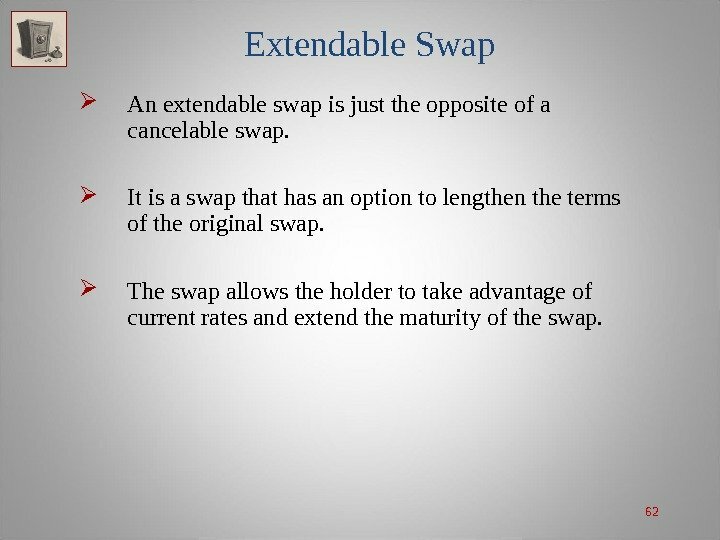 63 Extendable Swap Like cancelable swaps, extendable swaps can be replicated with a generic swap and a swaption. 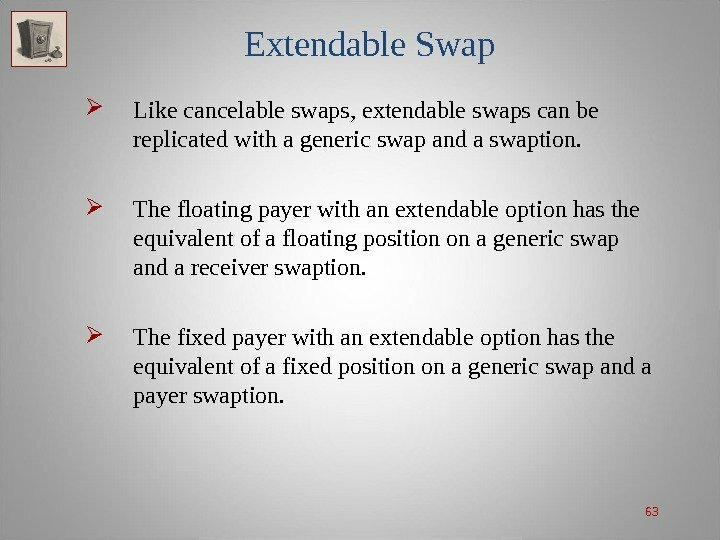 The floating payer with an extendable option has the equivalent of a floating position on a generic swap and a receiver swaption. 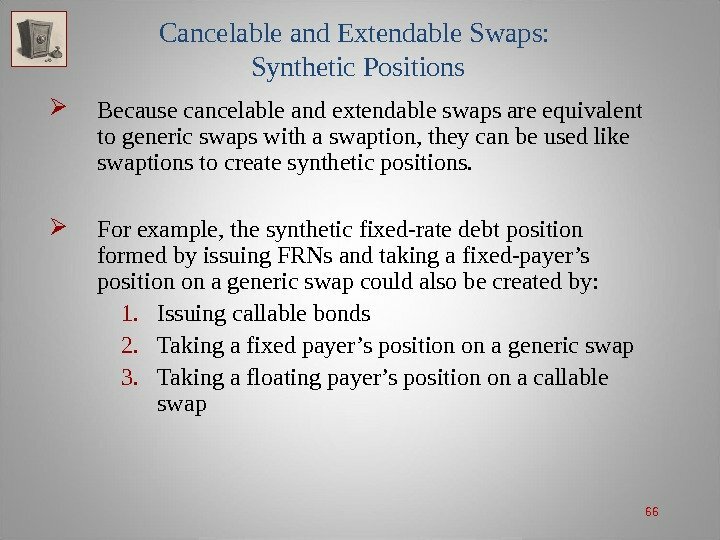 The fixed payer with an extendable option has the equivalent of a fixed position on a generic swap and a payer swaption. 68 Non-Generic Swaps Today, there a number of non-generic swaps used by financial and non-financial corporations to manage their varied cash flow and return-risk problems. 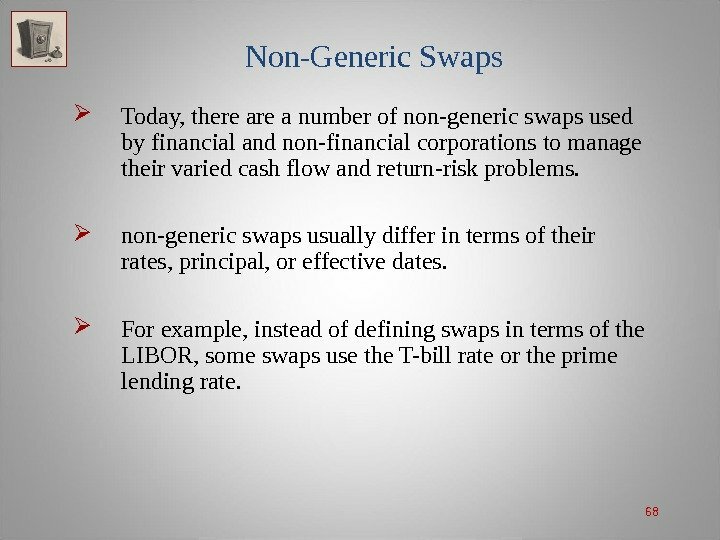 non-generic swaps usually differ in terms of their rates, principal, or effective dates. 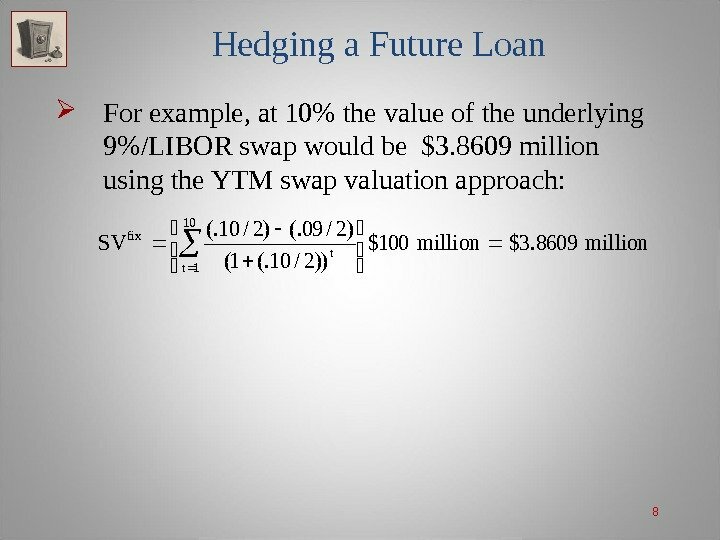 For example, instead of defining swaps in terms of the LIBOR, some swaps use the T-bill rate or the prime lending rate. 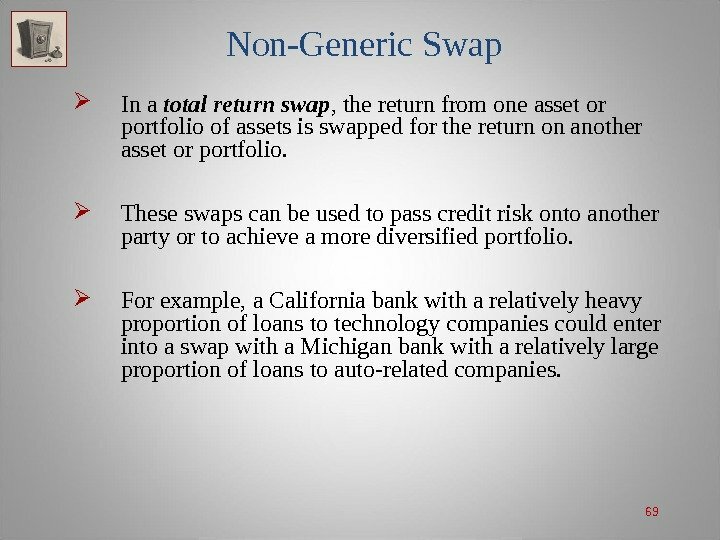 69 Non-Generic Swap In a total return swap , the return from one asset or portfolio of assets is swapped for the return on another asset or portfolio. These swaps can be used to pass credit risk onto another party or to achieve a more diversified portfolio. For example, a California bank with a relatively heavy proportion of loans to technology companies could enter into a swap with a Michigan bank with a relatively large proportion of loans to auto-related companies. 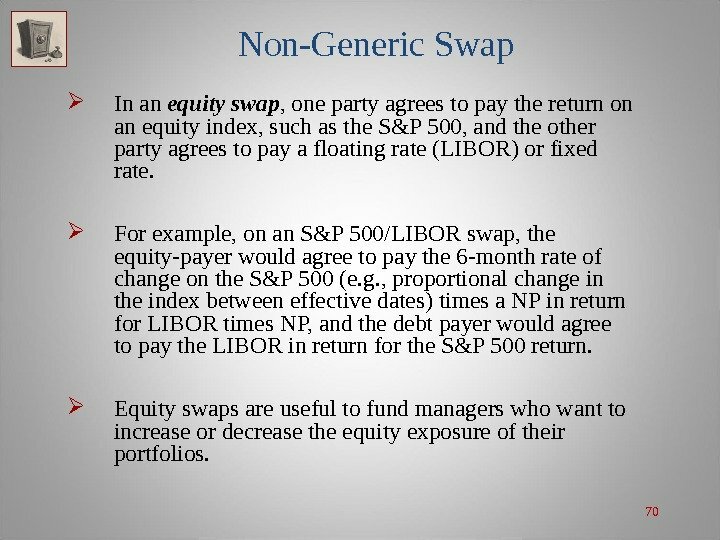 70 Non-Generic Swap In an equity swap , one party agrees to pay the return on an equity index, such as the S&P 500, and the other party agrees to pay a floating rate (LIBOR) or fixed rate. 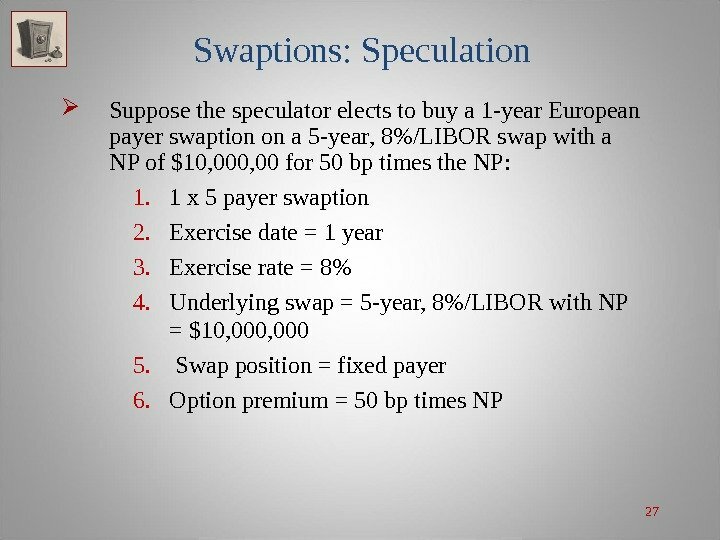 For example, on an S&P 500/LIBOR swap, the equity-payer would agree to pay the 6 -month rate of change on the S&P 500 (e. g. , proportional change in the index between effective dates) times a NP in return for LIBOR times NP, and the debt payer would agree to pay the LIBOR in return for the S&P 500 return. Equity swaps are useful to fund managers who want to increase or decrease the equity exposure of their portfolios. 71 Non-Generic Swap An amortizing swap is one in which the NP decreases over time based on a set schedule. Amortizing swaps can be used by companies that have fixed-rate borrowing obligations with a certain prepayment schedule, but would like to swap them for floating rates. An accreting swap (also called set-up swap ) is one in which the NP increases over time based on a set schedule. An accreting swap is useful to companies that plan to borrow increasing amounts at floating rates and want to swap them for fixed-rate funds; accreting swaps are particularly popular in construction financing. 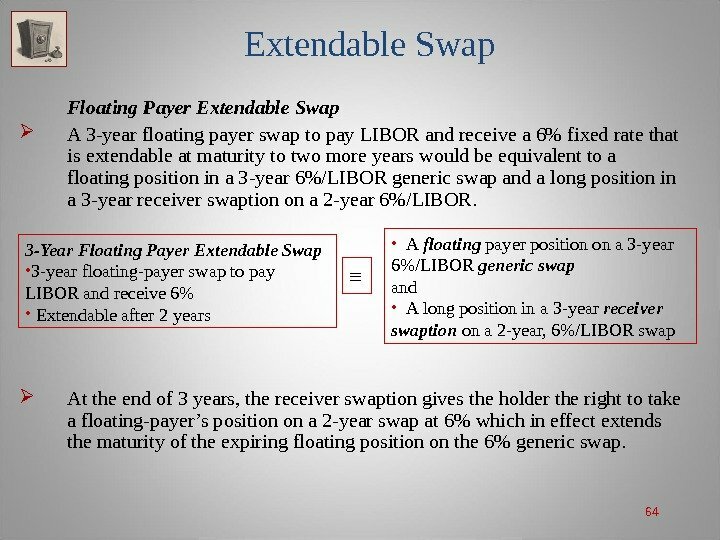 72 Non-Generic Swap Basis Swap : Both rates are floating; each party exchanges different floating payments: One party might exchange payments based on LIBOR and the other based on the T-bill yield. Delayed-Rate Set Swap allows the fixed payer to wait before locking in a fixed swap rate – the opposite of a forward swap. Delayed-Reset Swap : The effective date and payment date are the same. The cash flows at time t are determined by the floating rate at time t rather than the rate at time t − 1. 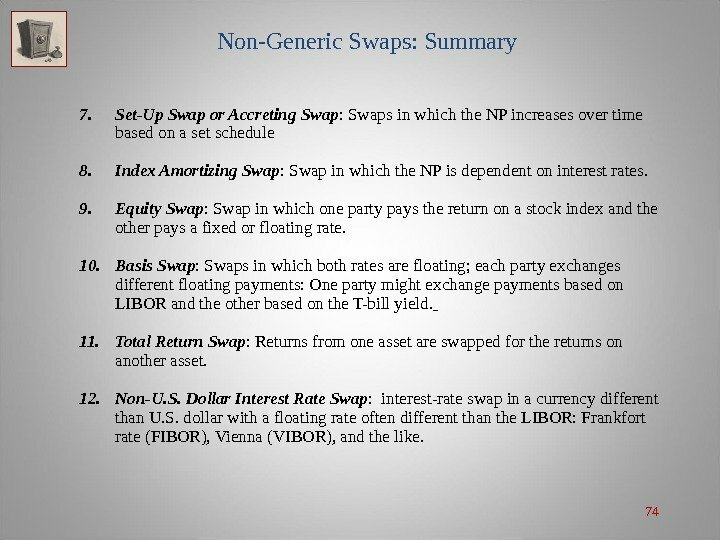 73 Non-Generic Swaps: Summary 1. 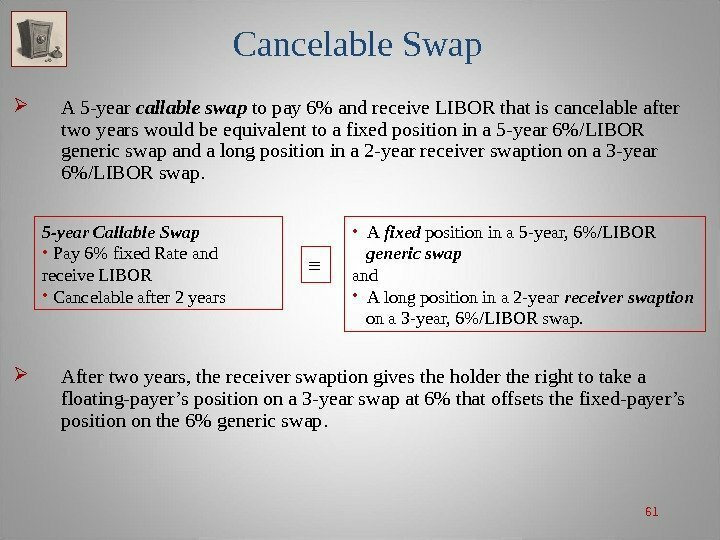 Non-LIBOR Swap : Swaps with floating rates different than LIBOR. Example: T-bill rate, CP rate, or Prime Lending Rate. 2. Delayed-Rate Set Swap allows the fixed payer to wait before locking in a fixed swap rate – the opposite of a forward swap. 3. Zero-Coupon Swap : Swap in which one or both parties do not exchange payments until maturity on the swap. 4. Prepaid Swap : Swap in which the future payments due are discounted to the present and paid at the start. 5. Delayed-Reset Swap : The effective date and payment date are the same. The cash flows at time t are determined by the floating rate at time t rather than the rate at time t − 1. 6. 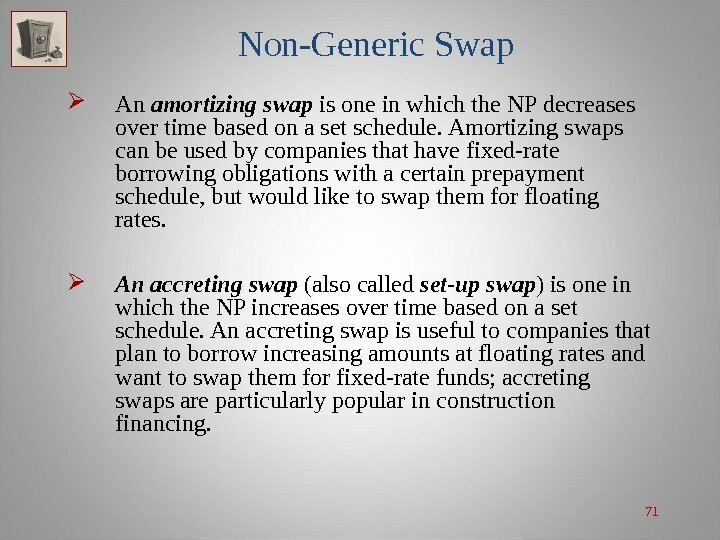 Amortizing Swaps : Swaps in which the NP decreases over time based on a set schedule. 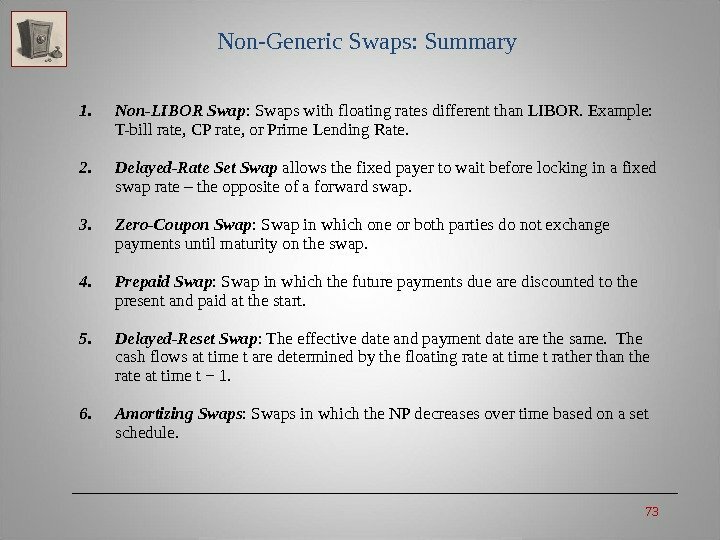 74 Non-Generic Swaps: Summary 7. Set-Up Swap or Accreting Swap : Swaps in which the NP increases over time based on a set schedule 8. 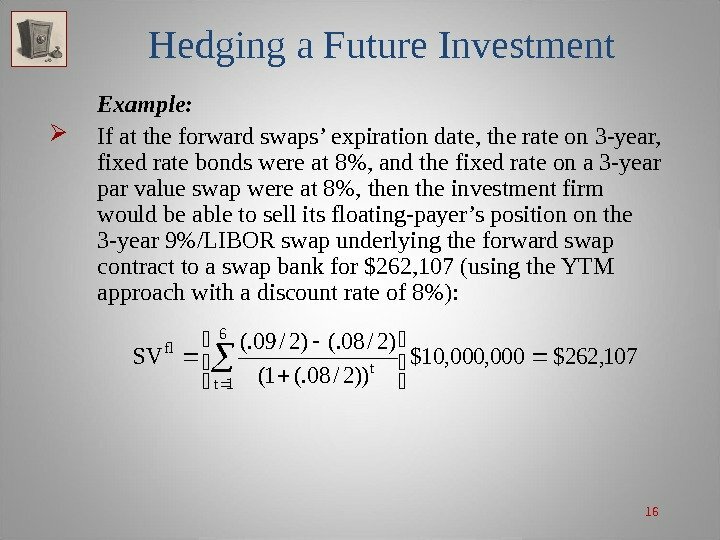 Index Amortizing Swap : Swap in which the NP is dependent on interest rates. 9. Equity Swap : Swap in which one party pays the return on a stock index and the other pays a fixed or floating rate. 10. 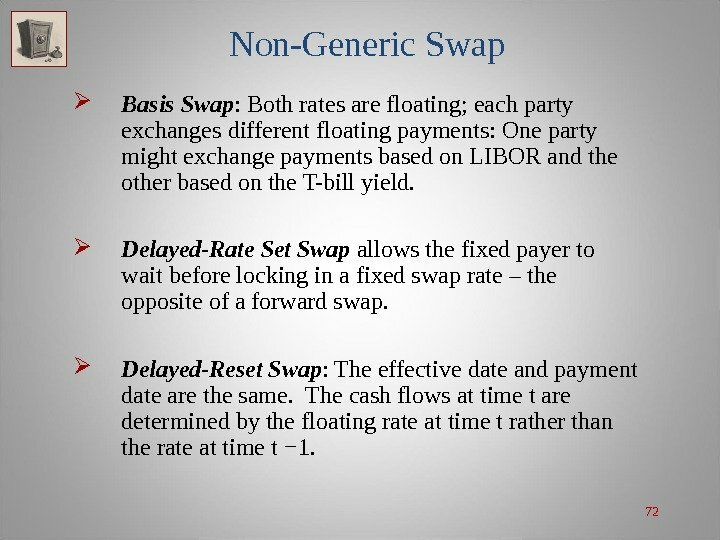 Basis Swap : Swaps in which both rates are floating; each party exchanges different floating payments: One party might exchange payments based on LIBOR and the other based on the T-bill yield. 11. Total Return Swap : Returns from one asset are swapped for the returns on another asset. 12. Non-U. S. Dollar Interest Rate Swap : interest-rate swap in a currency different than U. S. dollar with a floating rate often different than the LIBOR: Frankfort rate (FIBOR), Vienna (VIBOR), and the like.